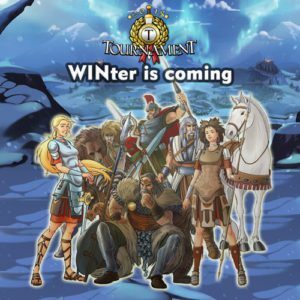 The latest news from the Tournament! 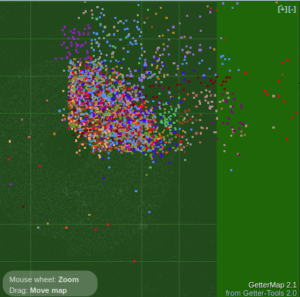 Analyses, interviews, maps, Top10 and much more. Welcome to the prestart interviews There is rumours about who that will cooperate with who and they are as often denied. Maybe we will get some useful information from this interviews. First out is Ros, an Italian leader and he introduce himself The war between SPQR and ru-team was drawing a lot of attention in Final 2017/2018. We are ofc curious what they will do this server but it looks as we will have to wait until server starts before we have an answer on that. Introduction: Hello! I’m Ros, also known as Quokka. 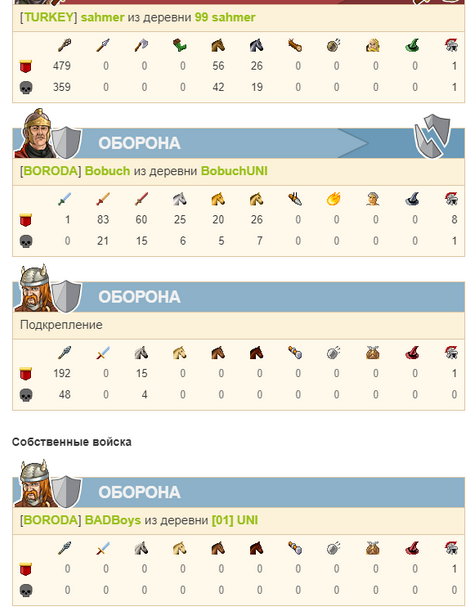 In the last finals my nickname was Valar Morghulis (some russians will remember me :D). 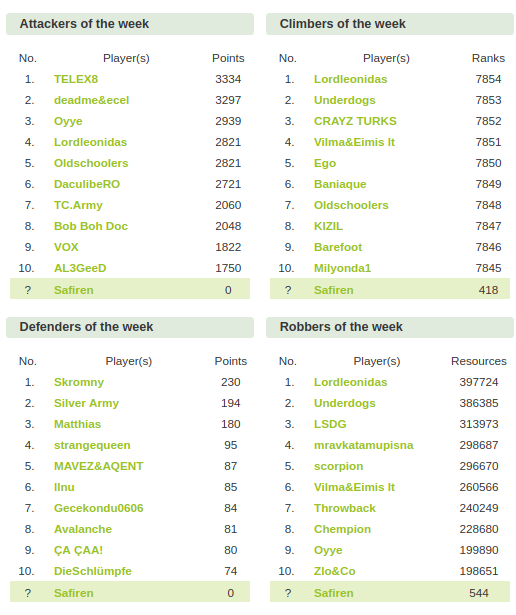 I'm one of the Italian leaders and UollasL's admin. I have played with them since 2013 but the group was born a long time ago. 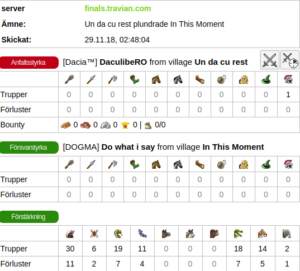 "What came first, Travian or Uollas?" Seriously, I'm ready to have fun with my team and with all of you and make a nice finals server. Now it's time to answer Safiren's questions! 1. We start with the question we all are most curious about. In which quad will you start and who are you going to cooperate with? That’s a good question. To be honest, the quad has not been decided yet (maybe +/+ or -/-, who knows! :D), as well as the groups that will compose the Meta. I don’t deal with diplomacy, I can only say that there will be 3/4 Italian alliances and I know that CZ and Germans players will be with us. Then there are other ongoing negotiations with other alliances, but I prefer not to say which ones until I have the certainty! 2. If you prefer to let that be a secret you maybe will answer on which alliance/meta do you think will be your primary enemy. I think all those who don’t play in our Meta can be considered our enemies, obviously we will focus first on those we will find in our quad. 3. What is your goal for the round? Victory, Just fun with nice team? Mess up for another alliance/meta? Our team always plays for fun. Without it the game would be boring and the players would stop playing! However, in my opinion, all the participants META aim to win and surely this is our goal too! 4. Your opinion about less wildcards this year. Good or bad? Will it make more players go for the qualification next year? I don't know exactly how many wildcards were released in recent years, and how many will be released this year. 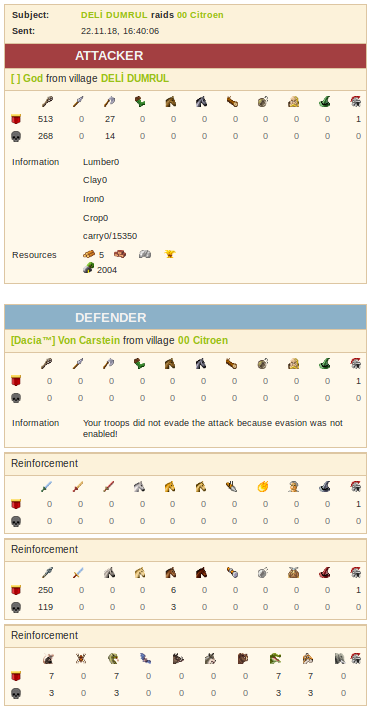 However I can not express a single opinion: on the one hand, I think it is right that wildcards will be less in order to prevent the use of these for multi-account, but on the other hand I saw with my own eyes that it is very very easy to qualify an account (in my server .de at the end of the round we were about 1600 players in statistics, so we were all qualified, even the farms!). For those who want to use wildcards for multiaccounts, my opinion, as I said, is that qualifying is pretty simple. It’s true that the goal is perhaps to prevent the multiaccount, but penalizes those who could not participate to the qualifications (it was still summer :D)! So I don't have a single answer! 5. As we all know the Tournament started as a championships between different domains and for some time kept that format even at qualification stage. Right now it's got much more mixed up. But what is it for you? Is it a world cup of different nations or is it more of a championships league of different alliances? And how does your team look like in regards to cultural/national background? I think that the tournament is more like a championships league with different alliances than a world cup with different nations . In fact, not always players from the same countries play together, Russians represents an example in the last finals: BAD-CERBER on one side, WINTER from another, PRIME from another one! Another example is the Polish, which if I'm not mistaken this year will be divided, PS on one side, PL from another with the Dacia. So I don't think that the Tournament is linked more to the nations, but more to the alliances and the relationship that exists between them. For example, Italians are not many players and we are always "forced" to make a meta with players of other nationalities, but this is not a problem, indeed it's a way to compare yourself, to grow and to have fun all together! 6. What are you usually doing before the finals start to make yourself ready for 4 month of the high activity that is needed in Final? Last finals were really very challenging for me. My alliance was in the BP area, with the promter's BAD on one side and the Br-Kiss on the other, I think I didn't sleep for 3 months LOL because of the attacks were often at night, and a leader can never go to sleep while his players are under attack! However, in addition to the game there is also real life, and being a university student I try to keep up with the exams! So this is what I did, I tried to get on with the exams because I know I will not have much time to study during the finals ahahha! As for the game, since the end of September I’ve started to contact all my players to know who would play and who not, fortunately I didn’t have to deal with diplomacy with other alliances, there are other Italian leaders for this! Next player is Turek from Poland. 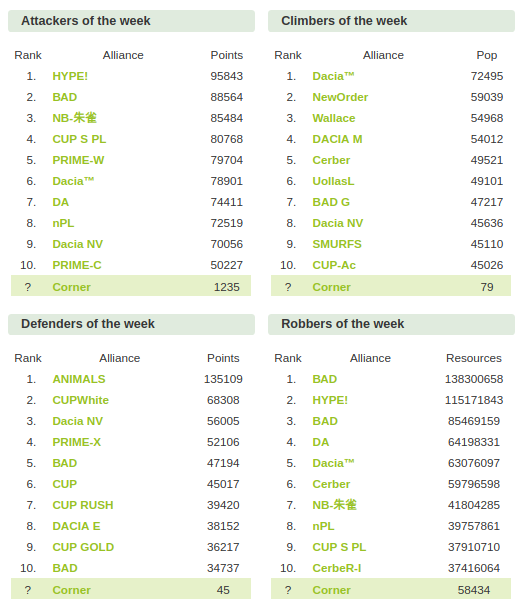 PL together with Prime contributed with an amazing turn in last Final when they decided to cooperate and their WW ended as rank 2. 1. We are playing in coalition with NB and Prime and we don't know quadrant yet. 2. All metas will be our enemies, if we want to win we must beat all. 3. Our goal is victory, but we know that we have small number of people compare to Arabs, Dacia or ruteam, so if we make all what we could to win we will be happy. 4. In my opinion qualifications are useless and I don't think more or less wildcards can change it. 5. For me this is still a World cup. We have a lot of unions between different countries, but still people know which ally is from which country. As long as we have nationality domains that will be a World cup. 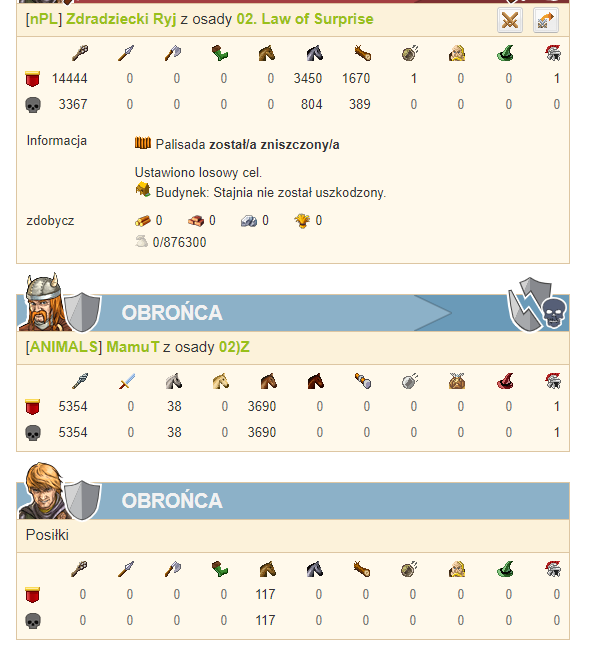 Few days ago we have a meeting with polish Travian players, this was good experience before server start, so we all know that we are playing with real people, not with bots. The last for today is Oğulcan from Animals. They settled near the gray zone in NorthEast last time and had a lot of fun, claiming their independence from the other turks. I wonder what they will do this time. 1. 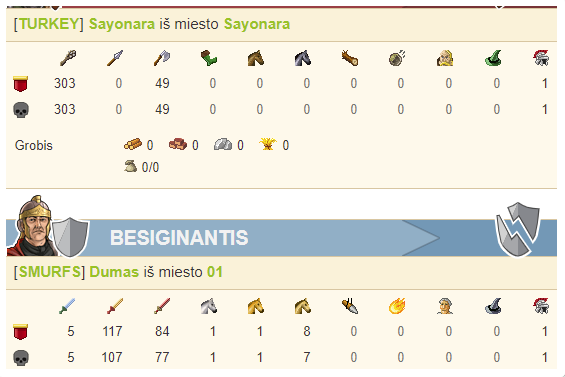 I can not tell for sure, our negotiations are not finish yet... but I am sure,we will make a good meta..
3. All of them. We always have fun with a nice team. This time, of course, we want victory. 4. This had to be announced before. So it should be implemented next year. This year, teams should be supported for a fair game. I also want to specify the difference between the elimination groups. C group is quite difficult to get tickets compared to other groups. 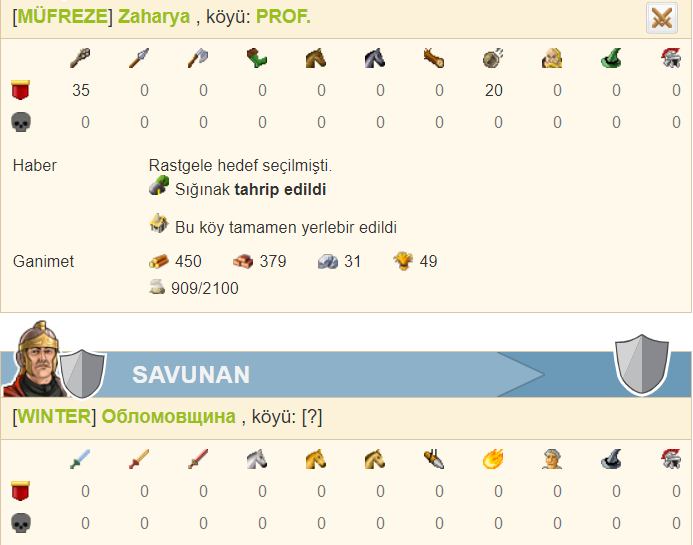 And the Turkish multihunter group really works. In group B, each account receives tickets. 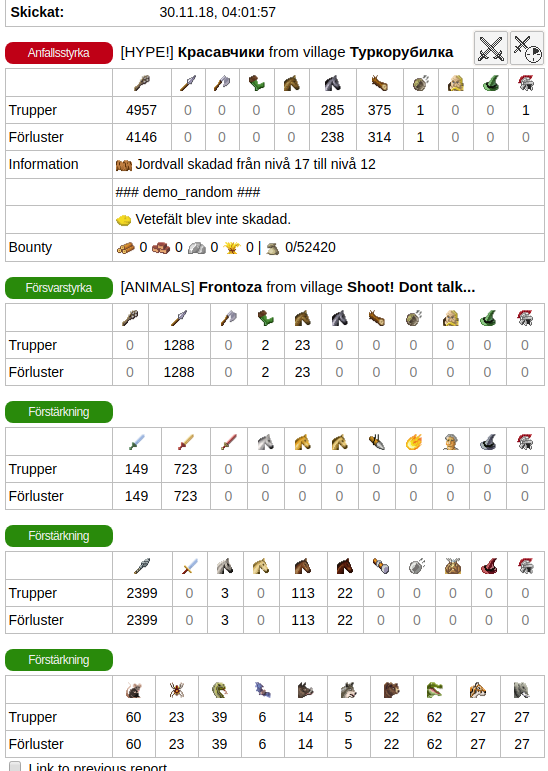 And I don't think they have multihunters. 5. A short and clear answer: Championship League. 6. We usually sleep. We know we can't sleep in the finals. Our enemies should know they can never sleep. Post was edited 2 times, last by Safiren ( Nov 1st 2018 ). Hi guys and girls! I have to confess I'm not sober but since I'm offline most of the weekend I have to try to post the interviews I have. First out today is Gabi Marton from Dacia K. Dacia won the last Final. They was the biggest meta and they will probably be this year too. 2. 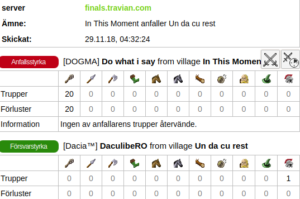 Finals is about war between Dacia and urss team plus their arrows. 3. Two victory’s in a row. 4. 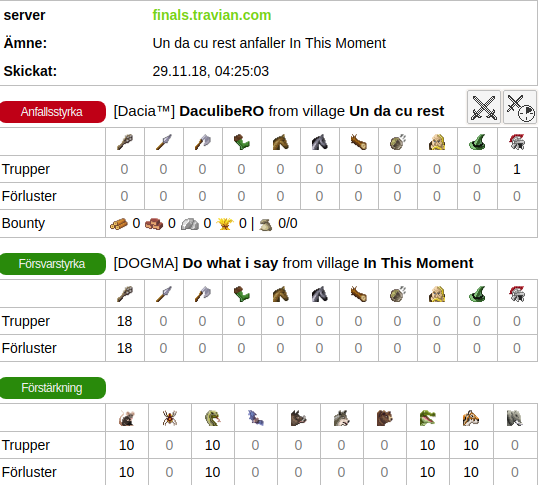 1st travian should rethink quals in another form to attract more players, and servers to be more competitive. 5. CL. 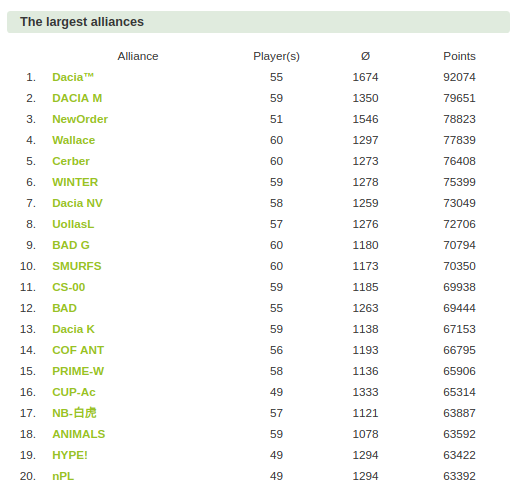 If we are talking about national teams, Dacia lost his golden team after com5 - 2010. So, from my point of view, all nations lost so many players that right now is impossible to win a final as a national team. If this finals came in 2006-2010, Dacia was capable to win as a national team, all romanian players. Trình Triệu from Vietnam was kind and answered my questions. 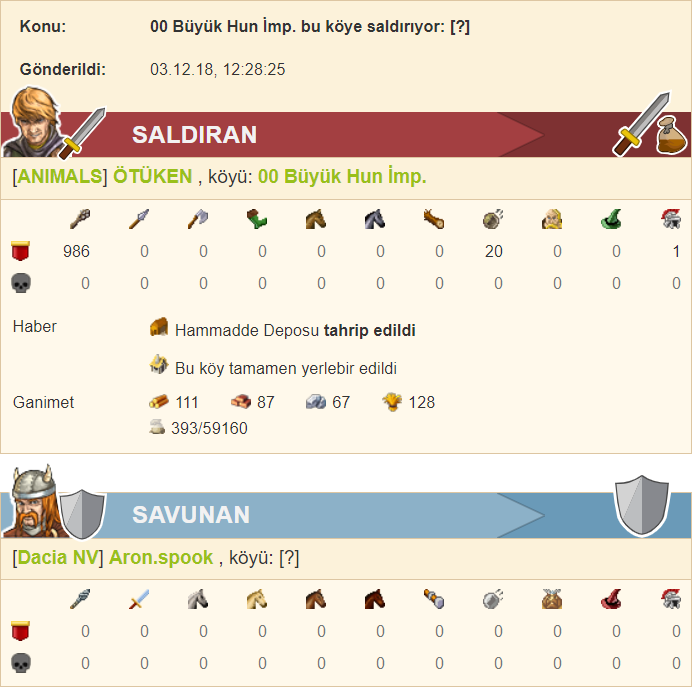 Last year they played with the Turkish meta. They have new friends this year - or? 1. In this finals, we associated with Team X3. 2. We are waiting for a general agreement from the group that we will cooperate. Of course, in addition to the peace relations (if any), we will have to fight with the other team as the way we play this game. 3. Our goal in the finals is simple because we will have to spend a week traditional holidays –Tet. 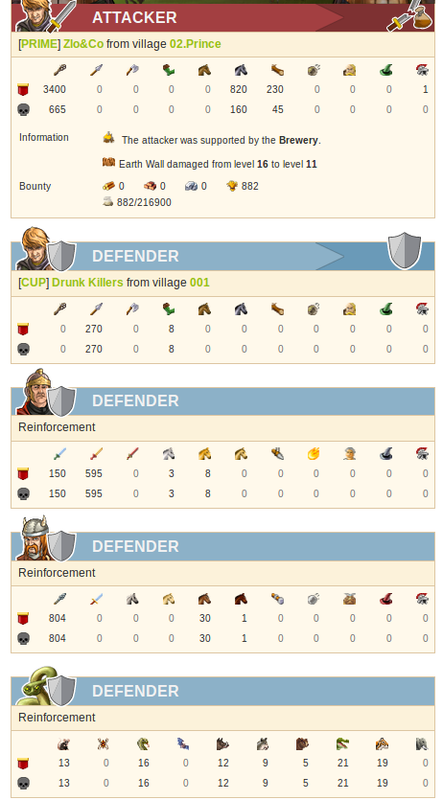 We support defenses for teams that we will cooperate with. 4. I think that good players' skills and team’s strategies will make the fight more attractive, and this is the factor that attracts more participants, not the problem you are talking about. 5. I think this is just a championship. The team linked together based on respect and equality to same aim to win. This is a war of the association, not the war of nations. However, there will be many teams with only one country, which will help them to be closer and to understand each other better for the same language and country. Our team will be only Vietnamese, we do not represent Vietnam as there will be many other Vietnamese groups not joining the finals or not the same purpose as us. We are always aware of the most cultural expression both inside and outside the game. There are a lot of people who are prejudiced against Vietnam team. But, if anybody was an ally or even the opposing side of us they would understand how our team works. We always fight hard and respect every opponent. 6. Of course we have to arrange our personal time funds to have reasonable time to participate. 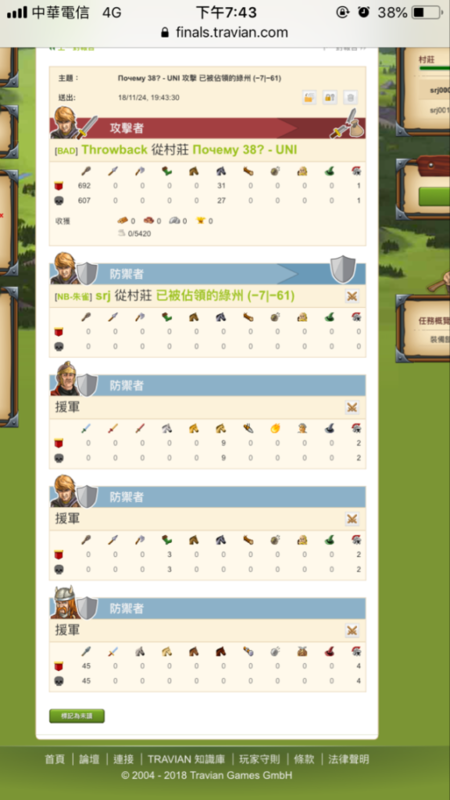 We will have 1 week of traditional New Year holiday and this time it is very difficult to take care of the game account. However, we will have the best preparation and reasonable in this stage. Adam HUN, I've been allowed to follow their ally chat, they are a good-tempered team that always have fun in their neighborhood and are good supporters to Dacia. 1. Just like previous years, we will start on NW quadrant with The Dacia. We are cooperating with him maybe 4 time in a row, so we don't change team in this final. 2. Naturally. Our main enemy will be everyone who will fight against us:) especially in North West quadrant. But surely Russians are the primary enemy. 3. Our goals are simple. For our team is, that we want to have fun, play as a little "Family" and show to everyone ( I mean to the world) that we can make important stuffs with a smaller team. However our goals for our Meta is maybe the most important. We want to help and win this final as last year. 4. 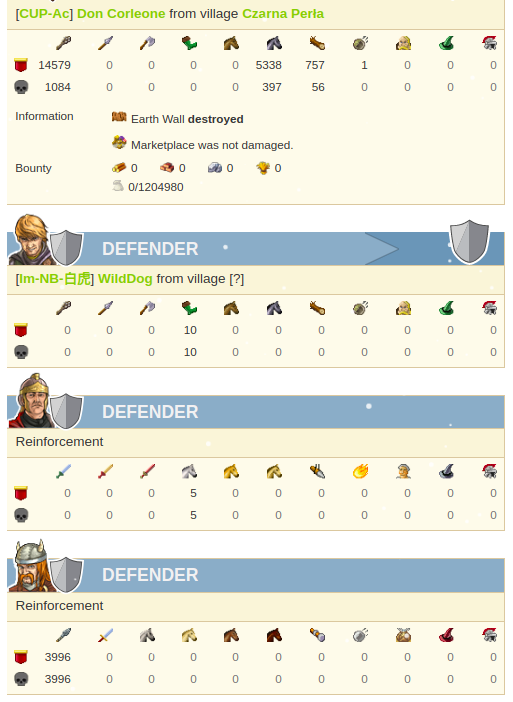 I don't know how much wildcard will be in drawing, but I think yes, this idea will be bring more players. Lots of players will do not get their card to the finals. Next year maybe more player want to qualify and play against the best players. As everyone seen, that in almost every qualy server almost/everybody qualified to the final. 5. In my opinion is, that this is more than just a tournament or a championship. This is a challenge. A challenge to everyone, to show the best. Nations and Metas are fight against each other. This is the place, where rivals and friendships are born. .For our team... We want to fire ourself, to bring out the best from us. Thai/India is an alliance that have supported different metas. Abishek was kind and answered. Hello This is Abhishek from H-M-B , people know me as Abhishek in Skype and [Monster Machine / Black Hammer ] in game. 01. In South West we will start .. and we are going to cooperate with BAD. 02. 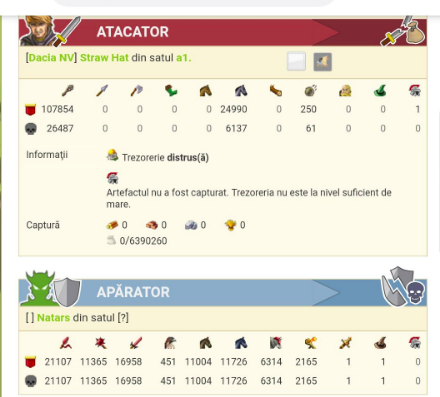 I think our primary opponent will be DACIA..
03. I like winning .. so my goal is VICTORY .. and at the same time have fun and toying with opponents. 04. 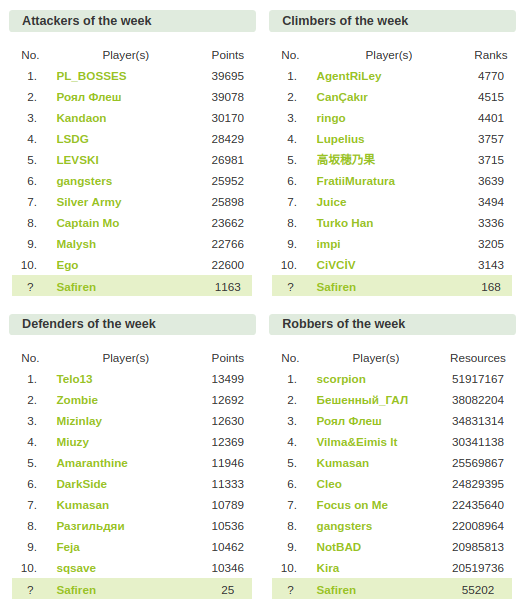 I think for less wild card this year ..players will settle many more multies in next qualifier to get the key .. not to play the server. 05. It's just a way to qualify . And reunion of old friends .. that's more important for me.. and we were in Group B .. alliance name's was C.O.T and TT .. most of us Asian, and some EU and South American ..so we are mixed .. we never find any cultural differences cause every one likes to have fun. 06. I am sleeping 12 hours everyday before finals.. . I know i won't get much chance to sleep during finals and completing my pending works so i can play freely with my friends. The last for today is from Arabia. Last year they had a tough server against Poland and X3. This year they have new leaders. I got in contact with Nourdine / Wise who answered my questions. He asked me to publish is skype too if you wants to contact him: nourdine_kan. 1 . Our miracle will be in 100/0 in the east betwin north east and south east . That maybe change to 100/100 if we play with Italy. 2. Our enemy I can't answer of this question because to my knowledge in diplomacy we don't have enemy right now. 3. 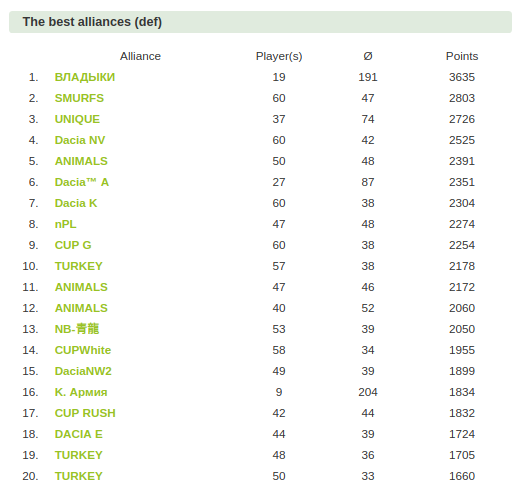 Our goal is make new friends alliance/meta and win together. 4. In my opinion it would be good because we see that few qualified this year. 5. Tournament for me is a world cup every year, we see new alliances forming making it more spectacular and challenging ,also it is a measure of our strength because in our servers we are the king but in tournament we just rivals aspire to victory. 6 . 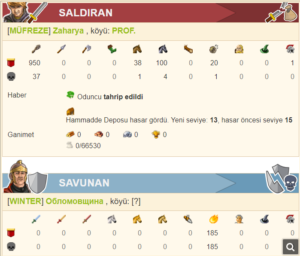 Now I'm relax some time I'm take a break from Travian until I enter with all my strength and readiness. Note : God is on our side in the north east. Post was edited 1 time, last by Safiren ( Nov 5th 2018 ). So.. have the interviews given any leads to where the alliances have decided to start? Let's make a short summary of what have been said. Ros/Uollas is hinting on NE +/+ which have been confirmed by others. He says they will cooperate with CZ and Germany players. Turek from PL says they haven't decided quad but will work with NB and Prime. 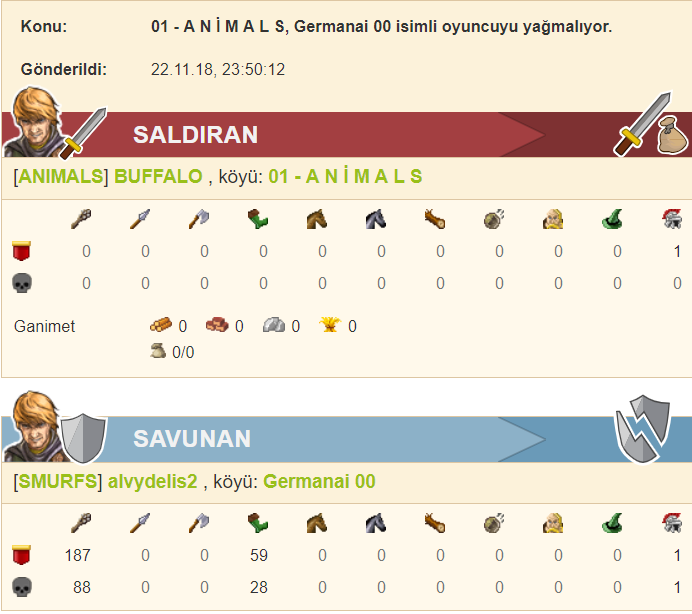 Oğulcan/Animals says nothing about it. Gabi Marton from Dacia K don't want to reveal anything either. Trình Triệu from Vietnam will be associated with X3, nothing about quad. Adám HUN tells us that it is Dacia and NW -/+ as usual. Abhishek Thai/India will start in SW -/- and cooperate with BAD. Smurfs (not sure about name in finals) - from qualification have not declared they plans. X3 Black (not sure about name in finals) - have participated in WW construction in qualifiction. May keep same coalition. 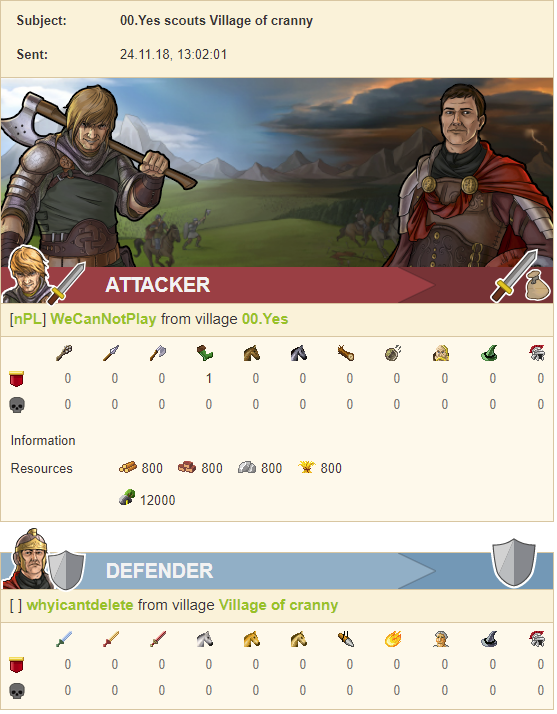 The rest of players will join other alliances or form tiny ones. 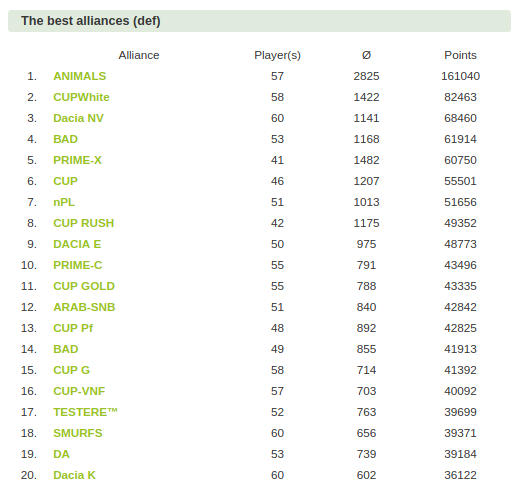 We played last final as Antarctica and this year qualification as LT&Friends. We will go to -|-. For others it will be opponents in their quads. It is a game. We play only for fun. I think the way wildcards are organised with random draw from list applied emails promotes cheating (I may be wrong traviangames might have very clever filtering system, but it might be hard to implement). So, the less the better. However, I like how some of invites are given on more personal basis. As the game style develops it is less and less connected to nationalities or cultural backgrounds, but at the same time it seems it makes game more fun and teams better balanced. 2. No enemies here, just a rivals! We will see who will be in the same quad and we will destroy all villas outside of Uollas META. 4. For me doesn’t matter on that. CS group policy = 100% accounts has a real owner. No supports/no multies. Admins should fight (I mean real fight with zero tolerance) with that because this thing killing that game. 5. I can imagine better format but it is as it is. We are not solving cultural/political/religious questions in our team. actually we will try to do the best job and it's all what we need to do. just joking... I am trying to enjoy all free days within Q and Finals but truth is there is no so many such days... we started the discussions about META and other things inside. of course, I also need to find a good team for the acc. 5. 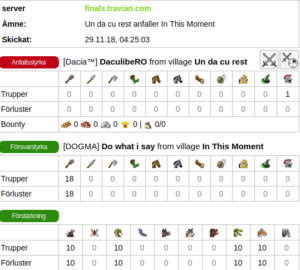 Travian tournament is not a nation's world cup anymore, but more like an E-Sport team world cup in my opinion. 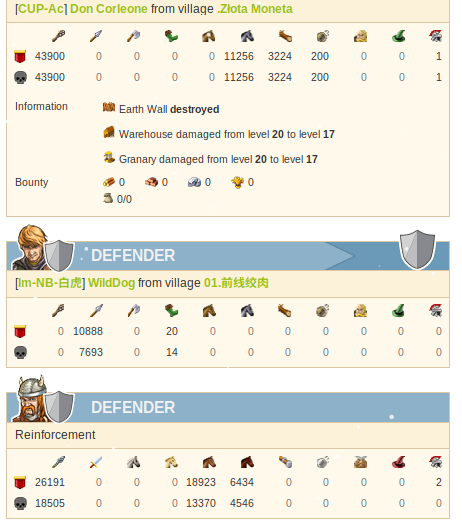 Every COA/meta benefits from multicultural players that makes a more challenging game, trading new techniques and ways of play. World cup changed into a very more challenged game to my mind, since every good ally opened to mixed cultural strategies. 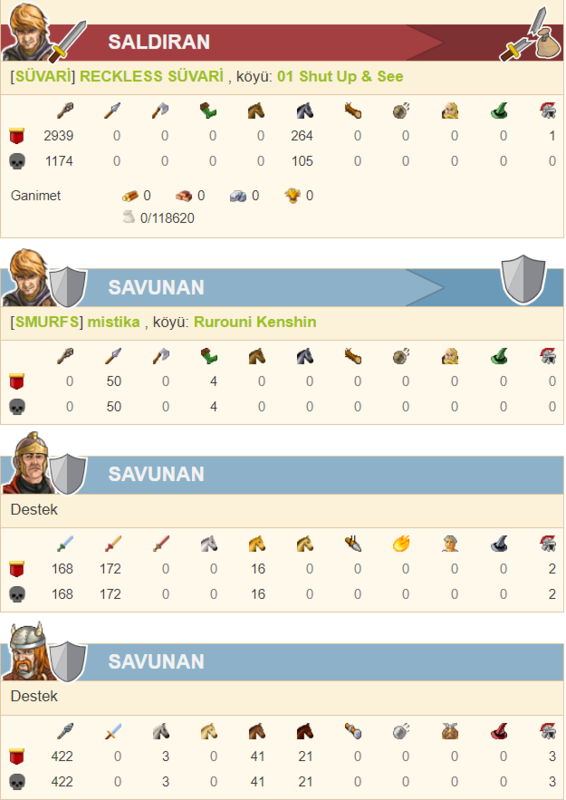 My team as been multicultural for a few rounds already when Makaveli was the leader but even now with the new ally. 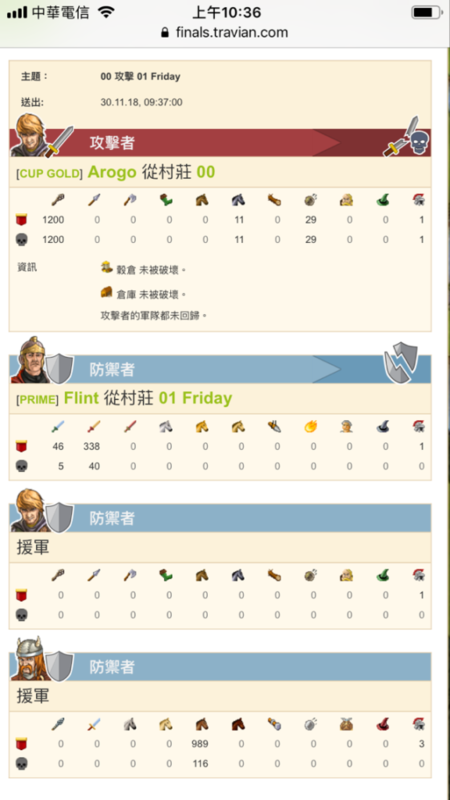 Many of my players plays in international servers plus I'm a co-leader of a very old ally on aux servers so all of this enrich the mixity of my team. 1. We will start in the SW and will cooperate with other Russian teams as well as with some few international allies. 4. Personally, I’m not a big fan of the qualification round. Too much time is spent for this uninteresting server. I’d advice to cancel the qualification at all and let everyone who is willing take part in the TT finals. For many years MHs are successfully fighting multi-accs, but the cheaters would still find a way to violate the rules. Yet, for many regular players “no qualification” would work much better. 6. We’re getting ready morally and gathering old friends. Just a wish… To make TT a bit more popular, please, add Huns and Egyptians. And please, diversify the prizes somehow. 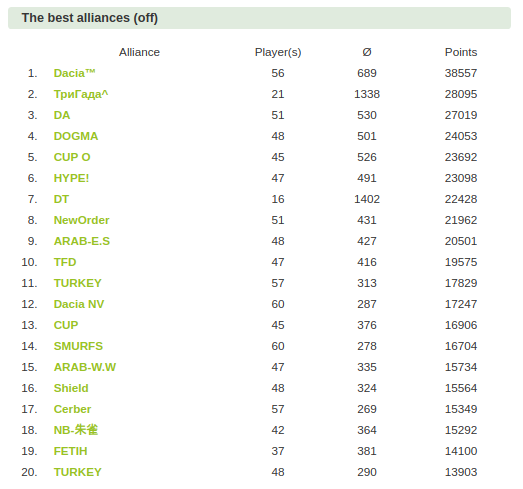 1- To be honest as Cof we haven’t had any alliance for this year, we are still open for the offers we haven’t decided between +/+ and +/- areas. 2- We wanted to fight against Poland and Prime because of last year we have changed our thoughts. 3- Our goal this year is just fun. We want to play a fun game with a nice alliance. 4- Actually this is very nice. I'm against that any wildcard is given. That makes more player to go qualification and the people who work for it go to finals.People used to go to the finals with wildcards and I don’t want this. This is not fair. 5- I think there is a champions league between different alliances. The balances change every year. Cof is the best team the way they see other cultures. Because in Cof there is Brazilian, Spanish, Slovak, Dutch, Belgian, Arabian players and Malaysian, Indonesian teams played.We have been very successful to play with the players from other countries. They can play as a part of family. Because Cof doesn’t represent any ideology. We are like a rainbow that has all the colours. 6- During qualification we are getting our players prepared for the finals. We organize in Cof competitions to have tickets and have fun. 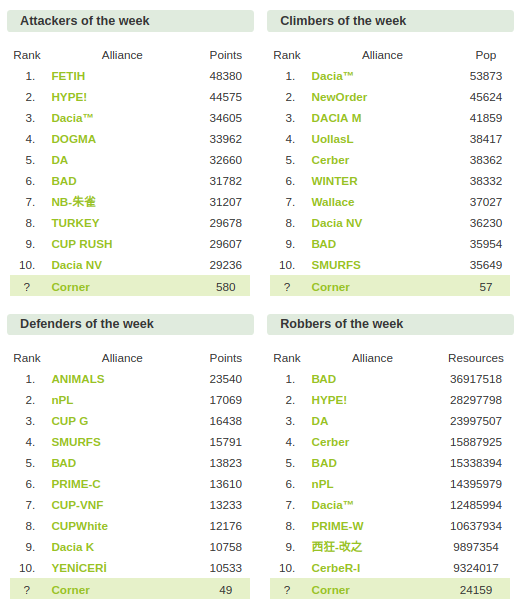 1：Last year final2017/18, NB had a great war against Prime. However after Final17/18, NB and Prime respect each other. Therefore NB will try cooperation with Prime during Final18/19. Maybe SouthEast is a good place. NB considers starting on +/-. 2：If NB starts on +/-, any foreigner, except NB's ally, who enter into +/- will be NB's enemy. 3：My goal is for victory and gain the prize of victory, of course. However NB members consider war and funny only. Therefore i should think how to use NB's goal service for my goal. 4：I do not know of it is NB's good news or not. 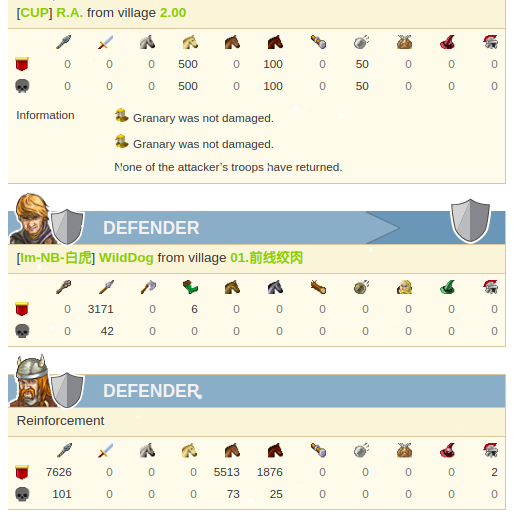 NB can enjoy a fair game, but that also means NB enemies have less multi, so that NB has no sheep to raid. 5：To be stronger the Chinese NB Alliance, NB will first protecting all Chinese players and team who play tournament. Therefore only very less foreign players will be invited to join NB. However besides Chinese, NB will keep her promise. Any alliance who trust NB and ally with NB, NB will try her best to fight for her ally. Ok, what information did we get now? Juri from CS says that they will go with Uollas. probably +/+ due to other info. Sky COQ will play as Gallia again together with G&V. Pristol WINter will this year play in SW-/- together with ru-team. COF haven't decide quad but are clear who the enemies is, PL and Prime. Hugo NB think SE +/- is a good place and will cooperate with Prime. CheckerB will not play with Dacia this year. 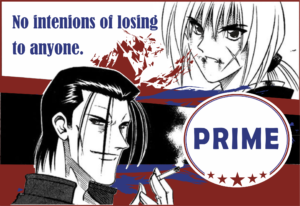 They have decided to cooperate with NB and Prime. 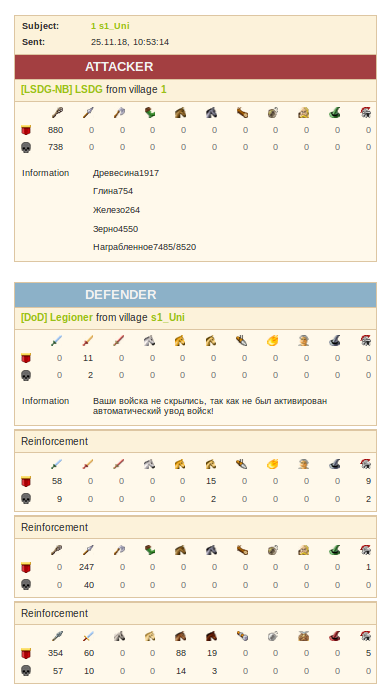 It wasn't easy to sort out the Polacks but we have a new ally with veterans, some from PL that will play with Prime/NB as PNT. PS will be PL and play in NE with Italians. 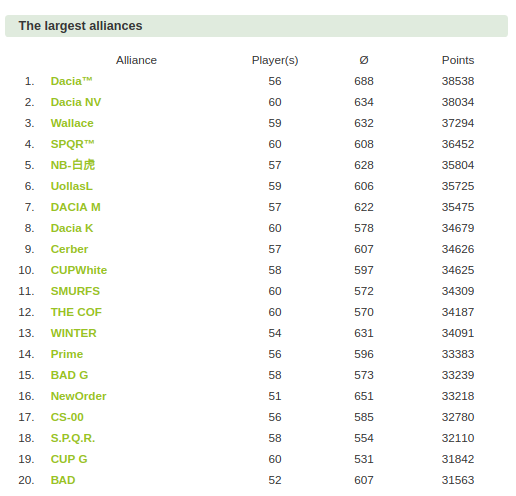 NTPL as said before will play with Dacia. Dacia will not be the biggest meta this year. So, that was the comments I got, what do I believe myself? I think we will see partly new coalitions this year. 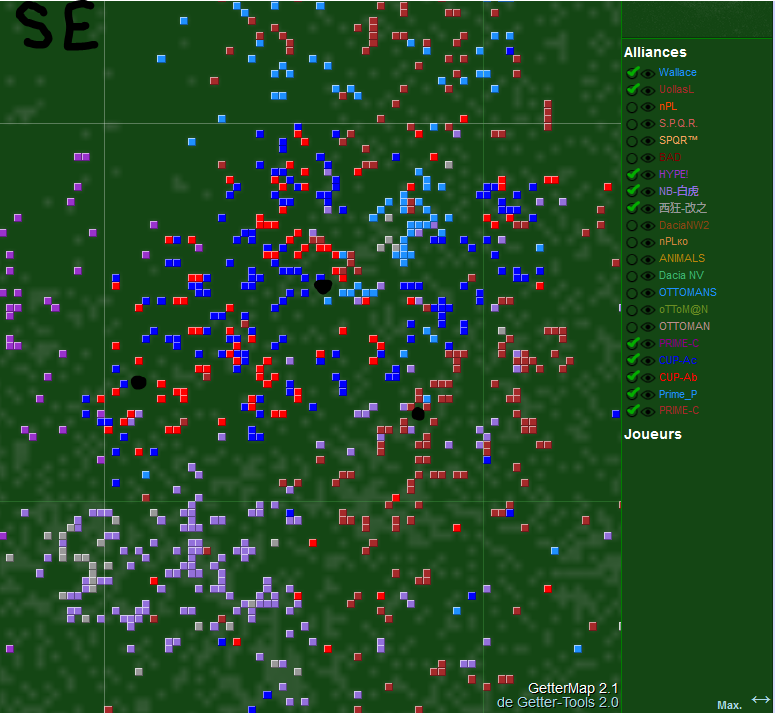 Alliances have moved between metas but the base is mainly the same. We will have 4 metas, one in each quadrant. It's difficult to decide now which meta will be the biggest but Russia have managed to engage several alliances that didn't play with them last year. 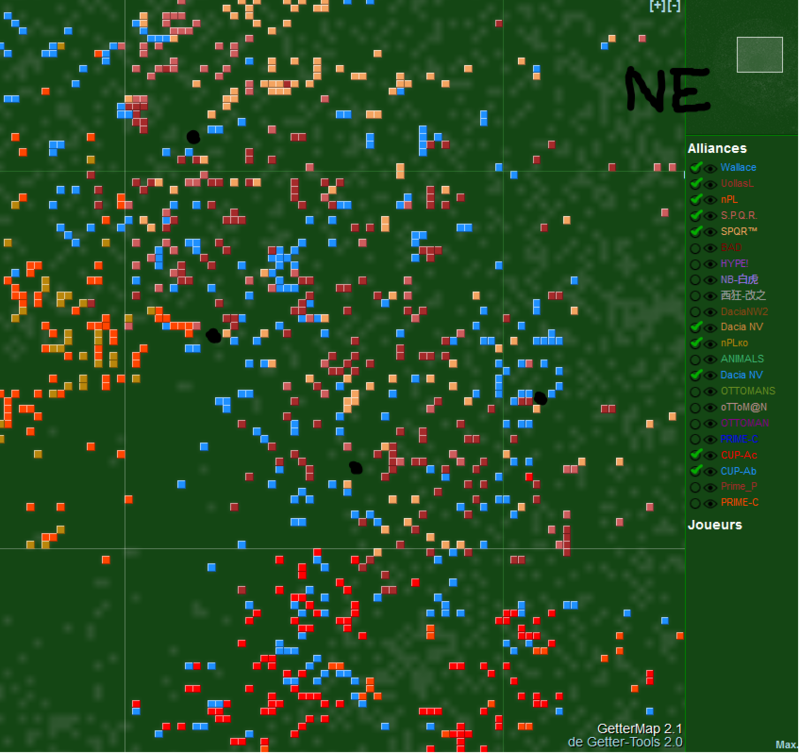 On the other side we have a lot of different nationalities in NE, so they might be quite big. Prime/NB in SE believes they will be the smallest meta. The lack of wildcards is difficult for all. A lot depends on how many members that played in qualifications and how many of them that will be encouraged to play Final. I have two more interviews. The first from Prime. 1. We will land in sector +/ -. We have already announced this information before. We also named our friends at once. Part of an international coalition composed of NB, PNT, Prime. There are many rumors about us, but these are only rumors. 2. We heard that in this final all teams will be strong. The Italian coalition (ITA + Arabian + Cz + COF + G&V + TURKISH ) seems very strong and big. Ruteam is traditionally strong. We know a lot of good players from there. As the main favorite we consider Dacia & Co.
3. According to my information, our team is the smallest of all at this final. The most important thing is to enjoy the game. This is our main goal. If we can win, we will be glad. If we spoil the party favorites, too, will be happy. 4. I think not. I am sure that the problem is in the format of qualification. Players use the qualification as a warm-up before a real fight. I think this situation fully suits the players. 5. I know that many players treat the world Cup as a tournament among national teams. I respect their opinion, but I think that the world Cup is more like club world championship. 6. We take out the skeletons of the cabinets and recalculate. 1. Yes, as I told you, because of personal problems, I did not have a Brazilian Luso project, so we're going with a little ally pt/ br at the invitation of Abhishek to play in - / - in support of BAD. 3. I always play for victory, be it mine or who I am supporting and of course always having fun with friends. 4. Yes, so more people will enter the contest in the game to show that they are better and will not enter because they participated in a lottery. 5. For me it's a world cup, my alliance is a cultural mix between Brazil and Portugal, united by the language. 6. Usually I rest, in that little more than 1 month of interval between tournament and finals, that year exceptionally I am playing the comx. Post was edited 1 time, last by Safiren ( Nov 15th 2018 ). Statistics is from Sunday midnight. 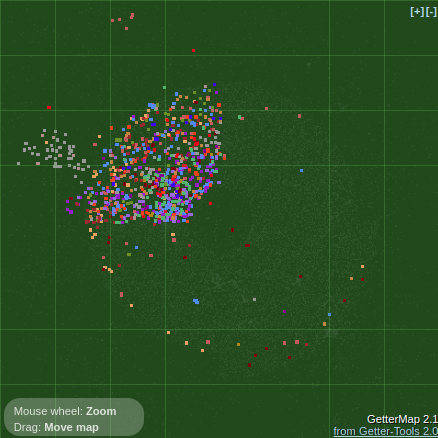 We hadn’t passed 8000 players yet but it is notable that that players are really active. The tribes have good proportions too. More romans than usual but it shall be a tribe for more experienced players, which we have a lot of here in Final - and pretorians is also good defence. 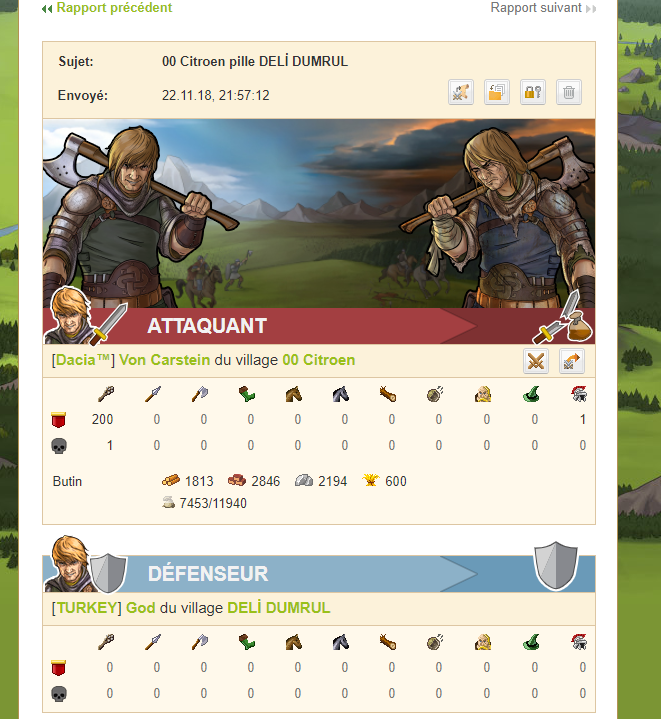 Gauls are less than they use to be, probably an effect of the better bot detection tool in combination with less wildcards. 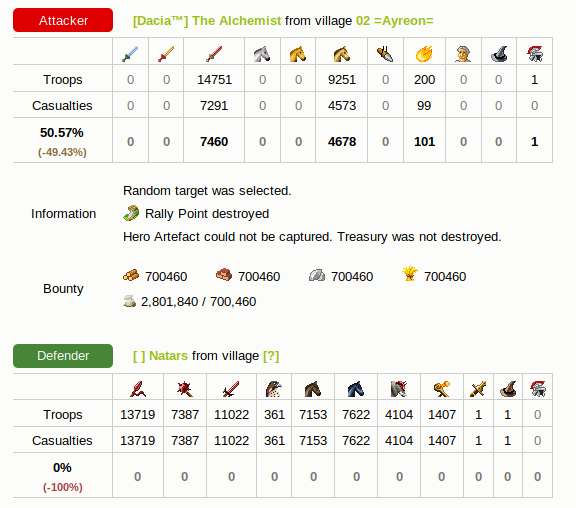 I clearly was wrong about which quad that should be the smallest, but with 2 metas there it might not be so surprising. 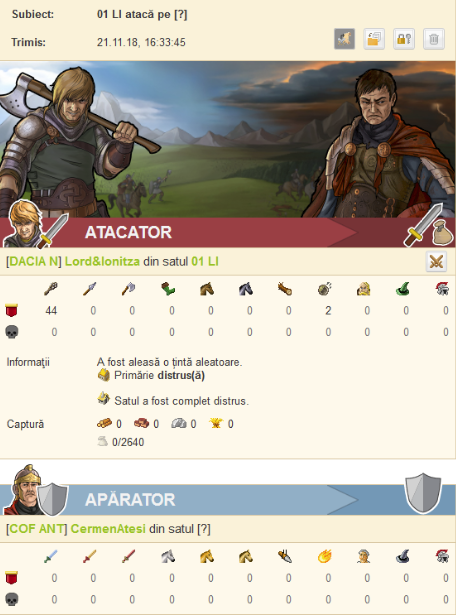 We have new constellations, but more about that in War diaries that will be posted on blog.travian.com on Friday. Let us establish that this years playing field is built for border wars, only in SE we will have fight for the dominance in the quad. 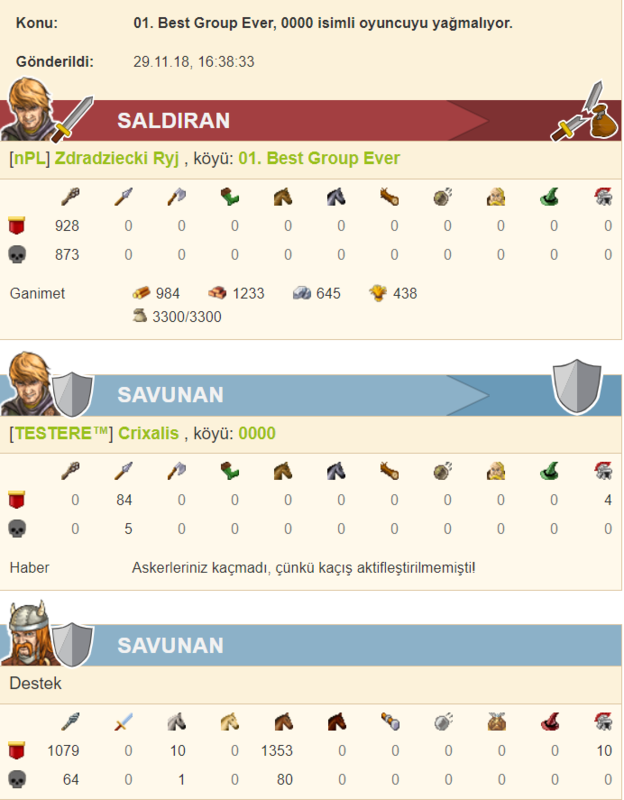 Edit: I prepared this yesterday and today it seems that the meta in NW after a quarrel between Emerik and Cicik now is divided in two parts, Dacia and Turkey. War is promised from both sides. Saturday morning before noon we had our first second village, by a team, Katarina Dacia K, that really know how to do it. 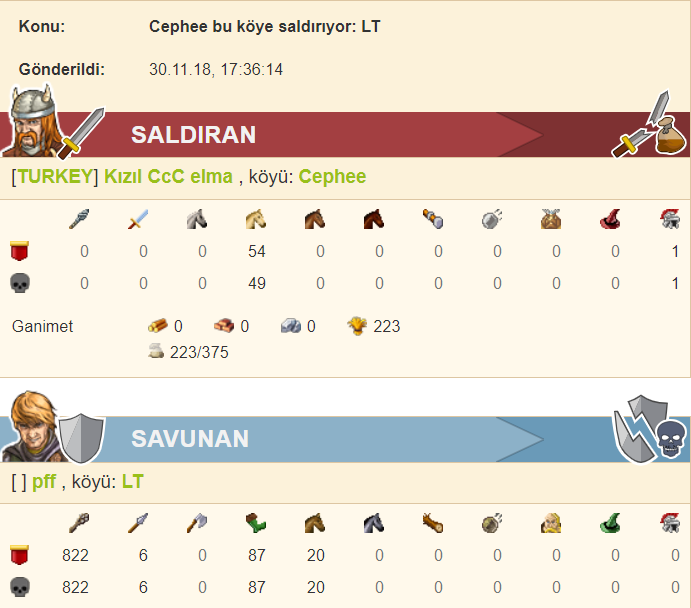 Safiren: This is the third time you are first with second village in Final (2015,2017). How long time did it take? Gabi: I registered at 14:20 and i have settlers today at 10:40 and settled at 11:21. 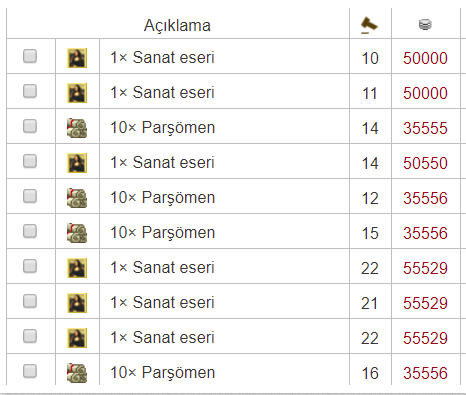 Safiren: How much gold did you spend? and on what? Safiren: You chose a 15c 100% close to your spawn, was it to be fastest? Gabi: That is dacia k zone according to the Meta NW map . Safiren: So you had a lucky spawn then? Gabi: I entered after 1:20 hours to be on that zone. 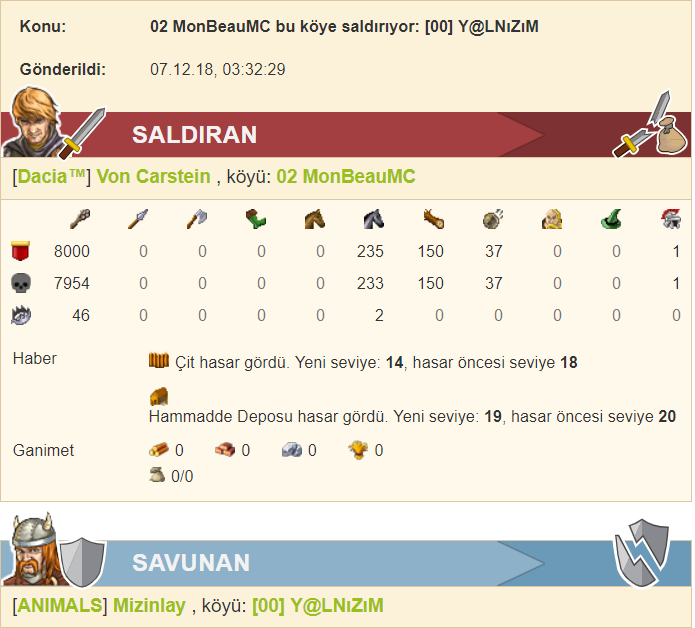 Safiren: I guess you had other accounts helping you to clean, did they buy cages too?How many times did your hero die? Gabi: It was a team work by 5 accounts. Our hero never died, we lost 15 clubs, we had 115 as most. Safiren: I read last year’s interview, did you get cp from dailys or did you have to party? Gabi: No party this year, we got CP day 2. 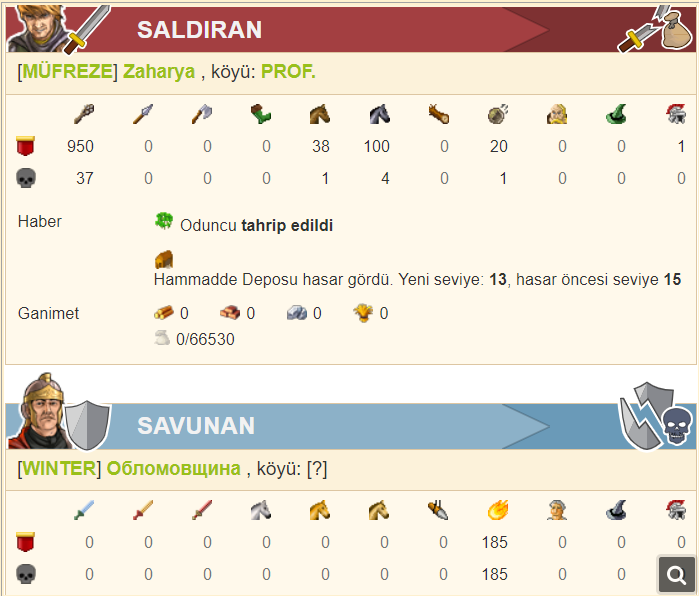 Safiren: Last year your fields was on level 3. Gabi: Same level this year. Safiren:. Do you have the same co-players as last year? 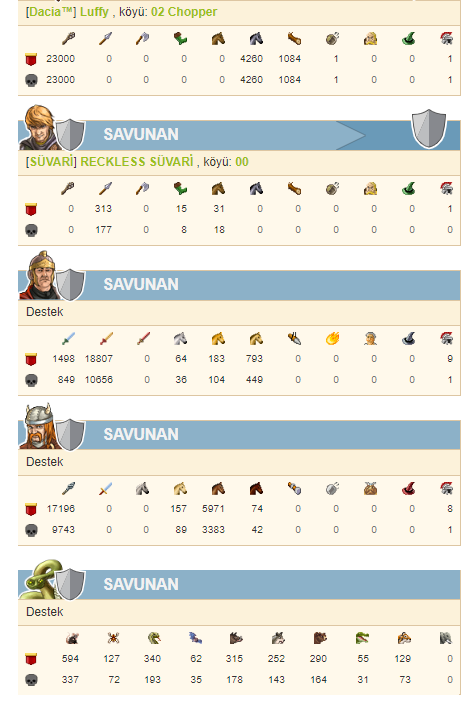 Safiren: Tell us something about your team, age, gender, how long have you played travian /tourney? 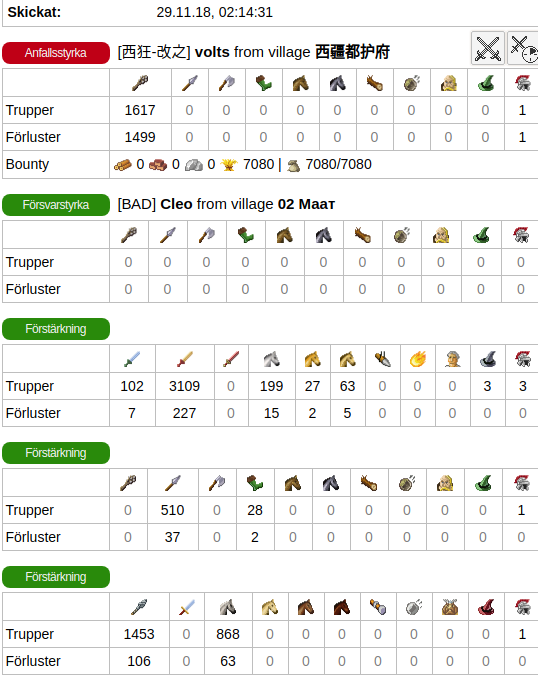 What do you do in real life when you're not playing travian? Gabi: I’m 31 years old, automation engineer, These is my 5th tournament (2012, 2013, 2015, 2017, 2018), and I started playing travian from 2006. When I’m not playing I spend my time playing football every week at least 1 time and table tennis every 2nd week. Movies and series. 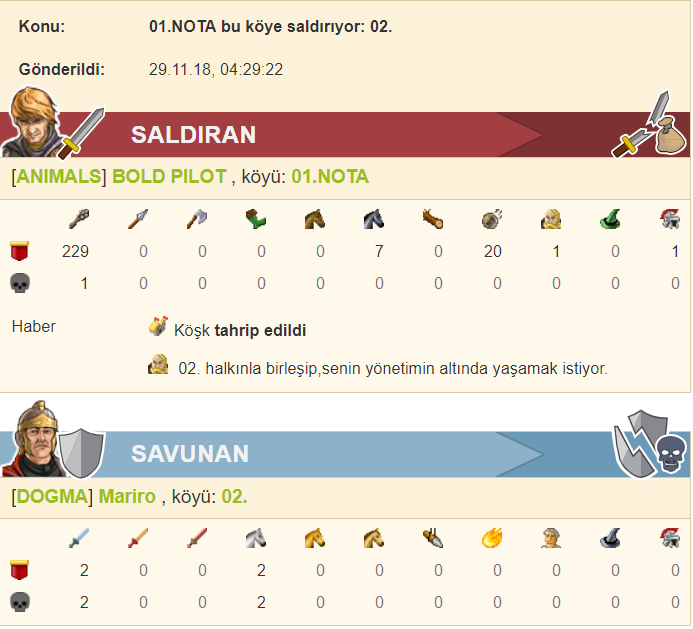 Lucian, 36 years old, mechatronics engineer.These is his 3nd tournament and he started playing travian from 2007. Tudor 28 years old, freelancer. 3rd final first was 2013. 2008 start playing. Last Q: What gift do you hope to get from Santa Claus this year? Gabi: Health and luck and a level 100 ww! A reward will be posted when I have remembered to bring home envelopes from work.. 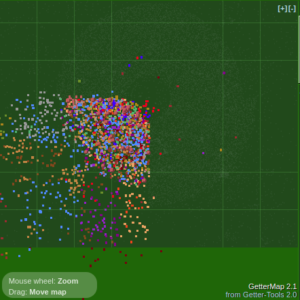 I counted the seconds two times, first Sunday at noon and I found 30 seconds villages. I counted again at midnight and now a lot of settlers had been running. 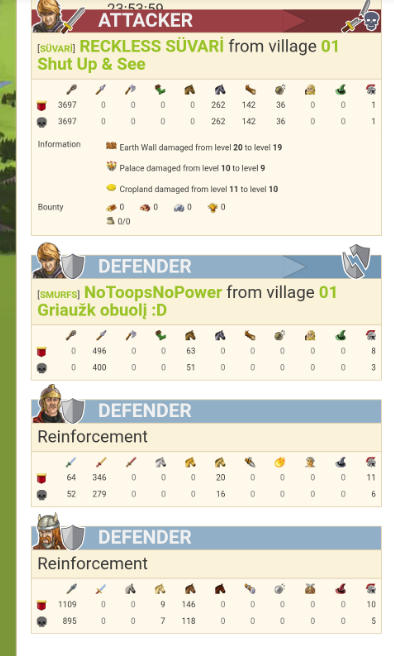 In total 911 second villages. Tuesday morning when the stats was updated again we was up to 2670 as you can see above. Uollas shared their map where the they have their seconds They are prepared for a fight against the NW border. Gladiator helmet was down to down to 16000 midnight Sunday. Oops.. wonder where Dacia found all those resources. Climbers list contains nearly only Turkey alliances. 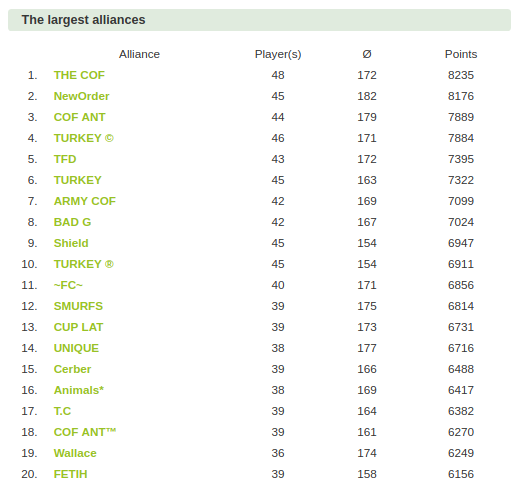 Turkey alliances built up their alliances very fast and it took a while before other alliances managed to climb the list. On Sunday midnight they was still dominating. This was all this week, the Corner is published every Tuesday night. 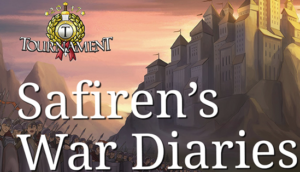 On Fridays we have War diaries on Travians blog. You are welcome to contribute with reports and stories about what happens in your quadrant. A short summary, maps are not completed. 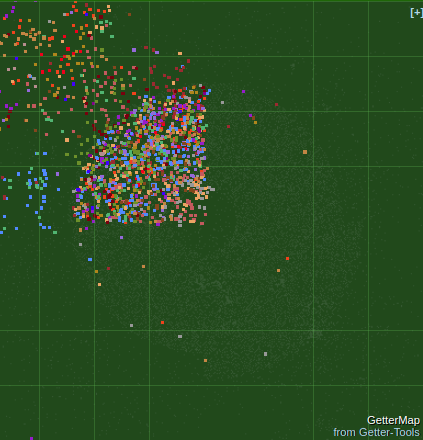 If you find something that is wrong, tell us 5700 players counted. Post was edited 1 time, last by Safiren ( Nov 23rd 2018 ). The first whole week is behind us and the fights is increasing. Accounts topped on 8054 and is slowly decreasing. The alliances begin to be fewer but bigger as embassies are up. 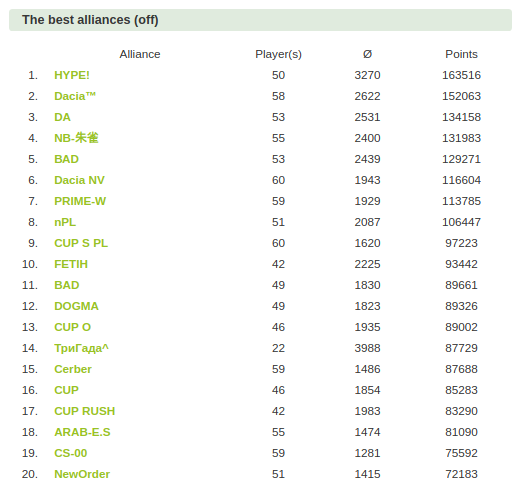 Our counting sheet isn’t 100% reliable but gives a good view of the situation about the metas - and that not many alliances are without bindings to a meta above rank 200. Dacia and Turkey could have been equal in size as Uollas if they hadn't broke up. Every meta consists of many domains, will they be able to keep together or not? More dramas isn't truly unbelievable. 1.There is a lot of Turkey alliances in NorthWest. Why have you chosen this quad? Are you going to cooperate with Dacia? Who are your primary enemy? 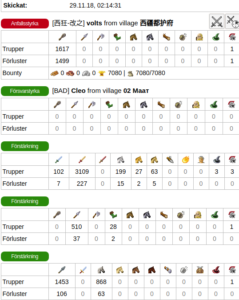 Tell us something about yourself: age, gender, how long have you played Travian/Tournament? Your real life: work, where do you live, what do you do when not playing? If you have to choose between to be a cat or a dog in next life. What would you chose and why? 1- The reason we chose this quarter is DACIA. We had a deal with them before the game started. They were relieved when the Russians did not send more players to the northwest. 2- We couldn't agree on diplomatic things.We chose the Dacia they chose the Italians. 3- It was, but Dacia broke it. We had made some deals before the game started, we asked for one thing, we asked many times.They told us it would be. But Emerik ignored those agreements and offered us something we never talked about. We didn't break the deal. 4- DACIA. Emerik doesn't know our strength.We'll show them who we are. 5- My name is Rezan(köle), 26 years old. 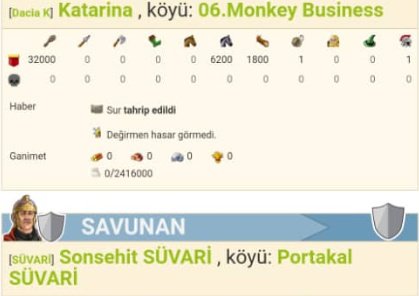 Last year my in-game name was AT in İNTİKAMI. I've been playing for five years. I've been in the finals for two years. I'm a student, I'm studying and spending time with my friends when I'm not playing games. 6- We are ANIMALS. We don't choose between animals. 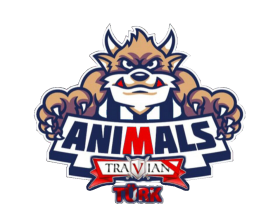 We're not just Animals.We are TESTERE, OTTOMANS, TURKEY, SÜVARİ, NORTH.W and ANIMALS. 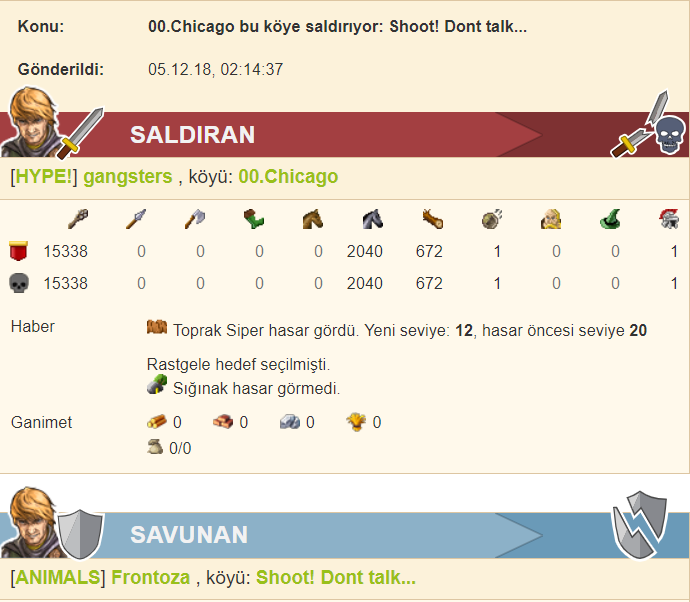 I have something to add.Turkish players usually do not come to this server. We want to break this, and we have a goal to participate more strongly each year. 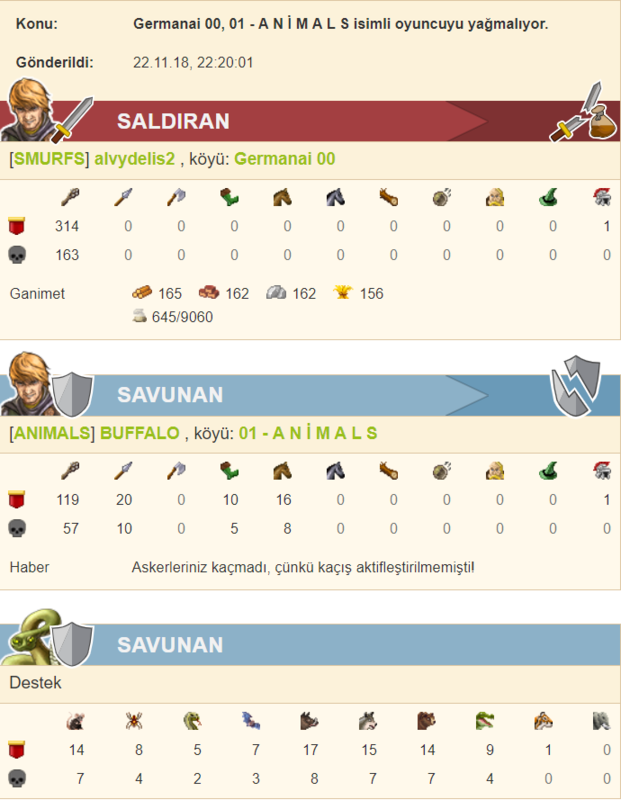 A few weeks before Finals a Skype chat room with a few leaders from Dacia and a few leaders from Animals (they said they can speak for a big Turkish team that will come to play this year intournament finals) was created with the purpose to speak about cooperation, and as far as I understood, we were considering the possibility to receive Animals & rest of Turkey in NW meta. 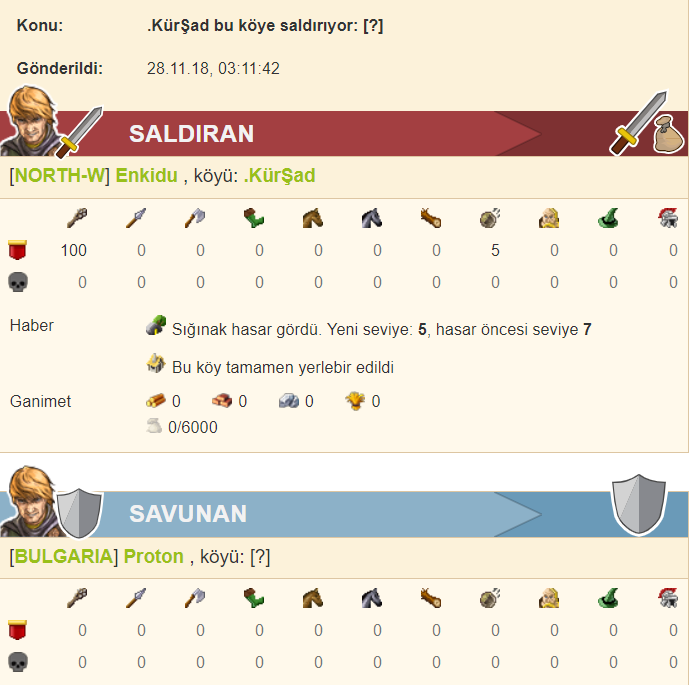 Dacia leaders and all our partners from NW coalition refused to accept a scenario with all of us supporting a Turkish WoW so in order not to break the alliance and continue our negotiations, I propose an option with 2 WWs in NW meta, one on Turkish account and one on Dacia account. Anyway, they kept quiet about WW for the last weeks and we focused on gathering more players, building a strong team, dividing the NW map between us etc. 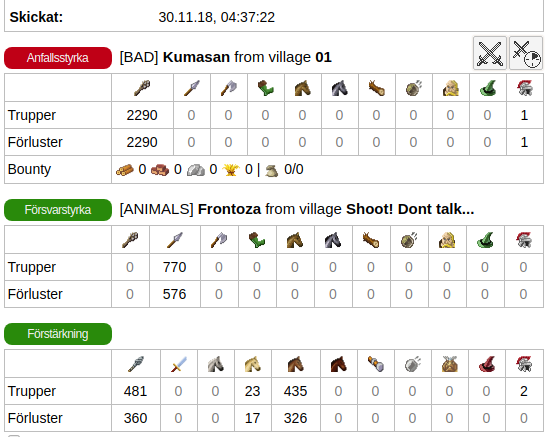 In day 2 of the server, Animals leaders asked for coordinates next to -100|100 so they can send there WW builder, but for us that came as a big surprise. We already had assigned to them all area around -100|0 and we were hoping if they really want WW they will be satisfied with that one, but apparently we were mistaken. 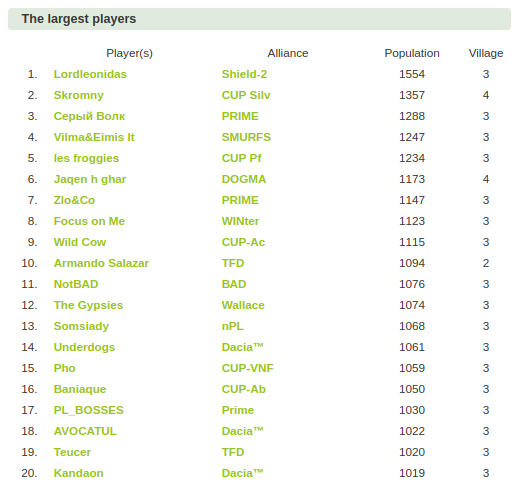 However, we asked all leaders from Dacia, nPL, 777, Smurfs, HUN and again we received confirmation that WW -100|100 should be on Dacia leadership account , control and supervision. So we had to explain this to the Turkish leaders. 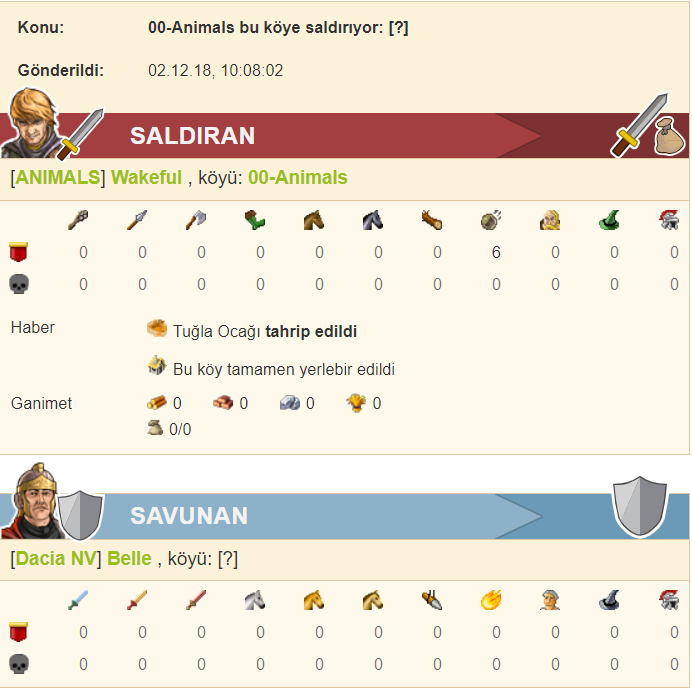 Cicek and Mahmut, Turkish leaders from ANIMALS took this personal, as some kind of betrayal, but in reality we never accepted to have one WW in NW meta on Turkish account, that was never the agreed and pre-arranged option. I was mainly a mess anger in this regard, however they consider that Emerik is the one who betrayed them and somehow tricked them with false hopes, which is false. It's mainly a misunderstanding due to lack of proper communication on the WW matter and due to a big difference in mentality and understanding of travian politics and diplomacy. It would have been different if this year ANIMALS & co would have worked with NW meta, helped us a lot and prove their worth, and maybe for future servers they could demand a lot more. 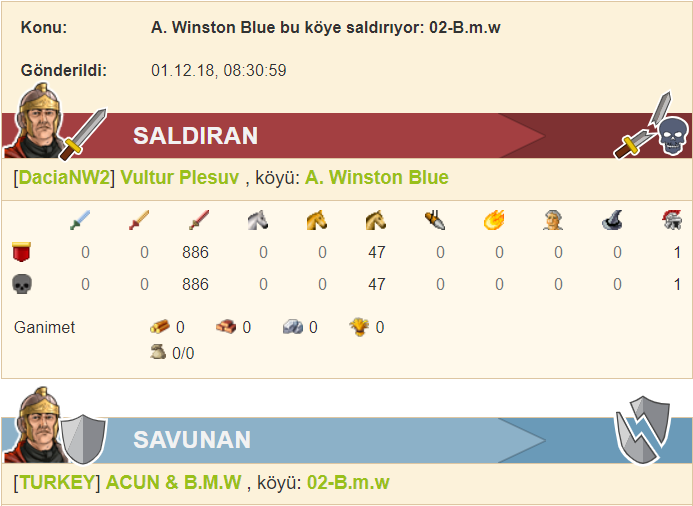 But for a new team joining the NW coalition, they presented the situation pretty bad... briefly: give us WW or else .. war ! Dacia and NW coalition will not accept to be bullied or blackmailed by anyone , no man and no team should make this kind of threats and expect to be taken serious. I am sorry for this diplomatic failure, of course I blame Turkish leaders, they try to blame me but in the end regular players whom we represent are the ones that will pay the price. Artwork is out and the first ones was expensive as usual, scrolls too. Now artworks are sold for around 10.000 silver. 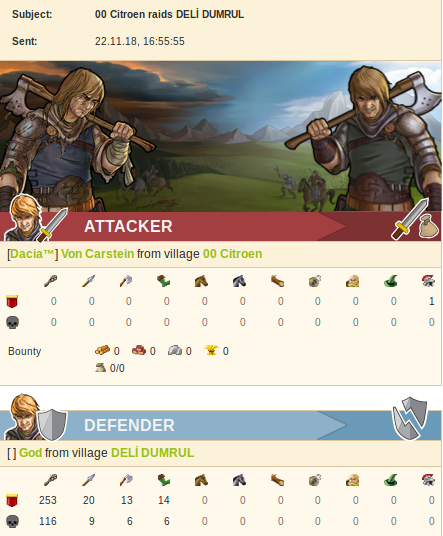 On the Tournament site you can find the biggest battle report for each day. 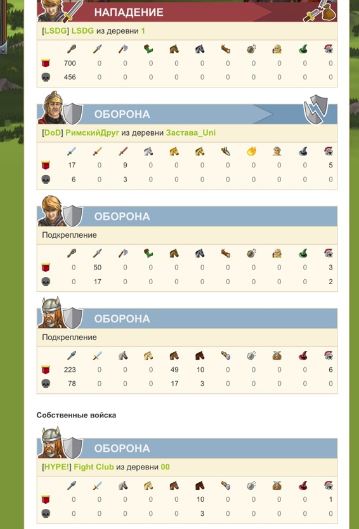 I got a nice story from Von Carstein Dacia which was rewarded with 30 gold. A lonely Vampire was bullied by those big fat turks! When he woke up, his storages were empty, burned by those fellow warriors. Scare and sick about the situation, the farmer had only 1 choice : he STOOD UP FOR WHAT HE BELIEVE!!! He sent letters all over the place to find other brave farmers or soldiers that would stand up for his cause. Awaiting for responses, the farmer was hiding in the last cranny of the village. But then, one turk, who believe his glory was worth more than his own pride decide he should risk his army to improved his legitimacy around his sector. The farmer took out his binoculars, looked up North and saw an army coming toward his last cranny. Without any hope left, he took his sword and waited for his destiny. And then, they were here, knocking at the door, asking for the surrender. VON CARSTEIN, VON CARSTEIN, VON CARSTEIN! The deads saved their last lord among the battlefield. But Von wasn't done. He took his sword and decided to counter attack those tyrants. Injured in the battle, he had to fall back. He lives another day to live another fight. Turkey and Smurfs. Looks as we can expect a lot of fights here. Buffalo got revenge - twice. A hero wall met this turk when he attacked a russian. One of the biggest hammers so far but could have used some rams too. Comment from Hugo. 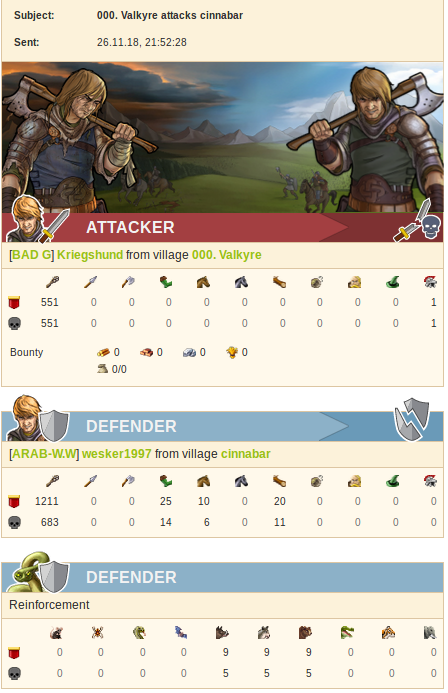 Noticed the attack 20 min before it landed and managed a hero wall. Zio&Co had rams, no heros in the defence. With such a nice hammer the defense couldn't do much. Always nice to kill an enemy hammer. 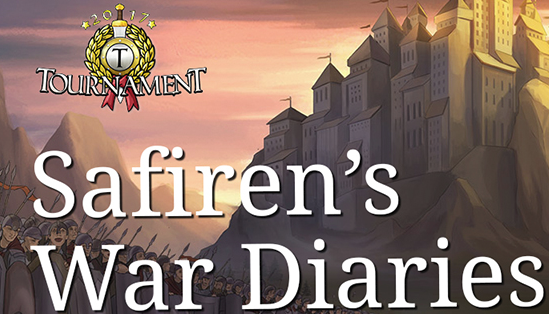 War diaries week 3 contains an interview with cristyy&dany from Dacia K that was first to chief a village. A keychain and 30 gold is the reward! 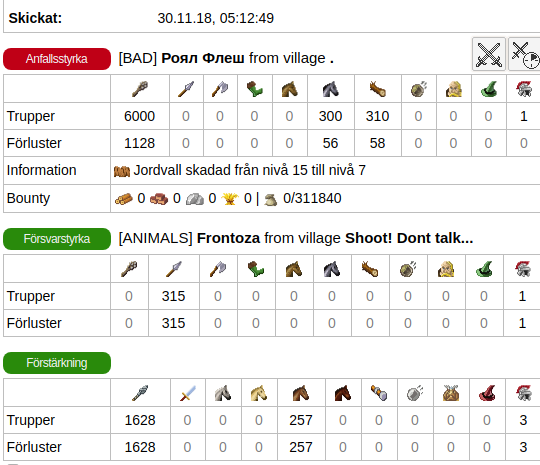 -35/4 ---> ANIMALS + nPL + HYPE! My name is Andrei, I'm 37, from Romania and I currently has lived in UK for 4 years now. This is my first Final and my first with Dacia. 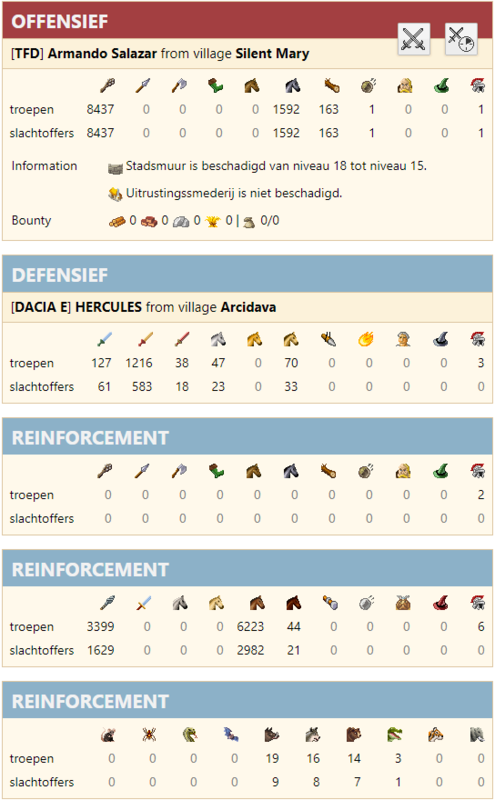 I haven't played in 4 years and I feel really excited coming back to Travian because I like playing Travian at a higher level with more challenge. I scouted a World Wonder in center. They have been conquered earlier for each year - and it might make sense - the earlier the less expensive. Let's start with a "funny" report. 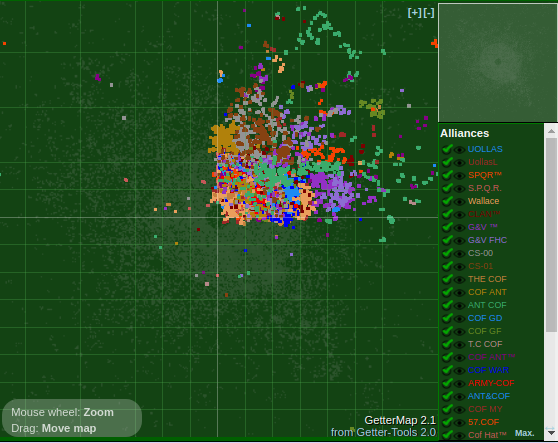 This week I checked croppers, I wanted to know more about the gray zone and which alliances that had been most successful to get the croppers closest to center. I started to do a map for the gray zone and found players from 9 alliances inside. 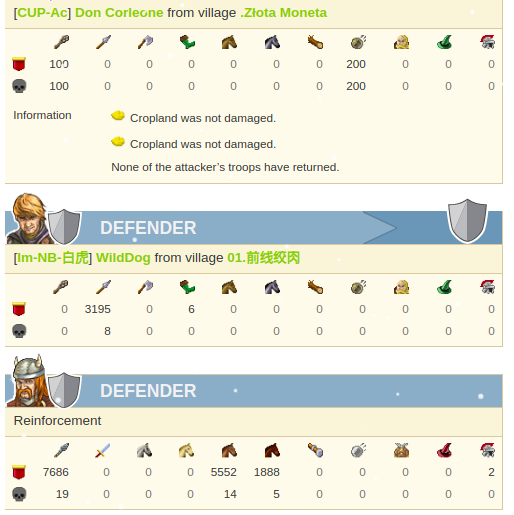 Wallace and Uollas in NE, CUP-Ab, CUP-Ac in SE, Hype! and F.Y in SW and nPL in NW. Two Turkey alliances have a couple of members in there too, OTTOMANS and YENİCERİ, but neither of them seems to have a future there. I continued outwards to coords around x/y 70 (gray not included) and in NorthEast the Uollas meta have gained 75 croppers, UollasL and Wallace have most of them, 48 together. In SouthEast we have two metas, CUP and International team SE. 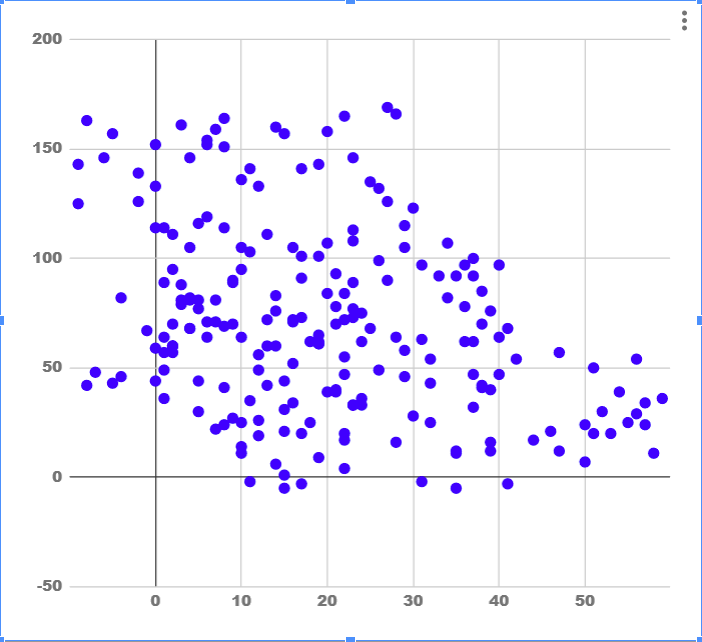 CUP has the area closest to Gray and 30 croppers of which CUP-Ac has 17 . Int SE gets stronger when a bit more far out and have 38 croppers with NB-白虎 in top with 11 croppers. BAD in SouthWest have been most successful so far, 33 croppers and in total I counted to 59 croppers for the Union. NorthWest is also divided in two metas, Dacia and Turkey. nPL has the area closest to gray and 9 croppers (remember - gray not included) The rest of Dacia have settled behind and Dacia NV has also 9 croppers. 28 in total. 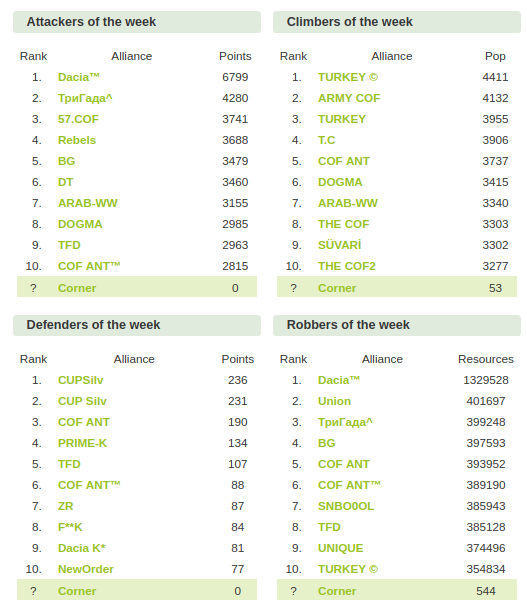 Animals is between nPL and the rest of Dacia and has 17 croppers. In total 21 including the other Turkey’s in the counted area. Summary: The Gray Zone don’t seems to be of any interest at all, it is sparsely settled. Nice croppers with extremely good oases isn’t enough to attract players, especially since you don’t get culture points when settling there. The World Wonders isn’t attractive either, too hard to defend. I have heard voices saying that in Final all WWs should be in center to make the game more challenging, I can agree with that. It’s no surprise that NE and SW have had no problem to get the majority of the croppers in their quads since they have no opponents. Maybe with an exception for Union that have Unique taking a dent in on their area but it’s out on -110 to -130 y coords on the border and I haven’t checked how many croppers they managed to take. SE and NW had a tougher mission as mixed as they are with the enemies and who that will gain the control in the quads is still in the future. Strongholds is building as you can check on the maps. I’m not sure when they was updated the last time. Hmm, NW meta is Dacia, well I can’t change that now. I didn’t noticed when I took the screen, just now the table only shows half the numbers. I took this screen yesterday when it showed best numbers. International SE is China + Arabs + Prime. 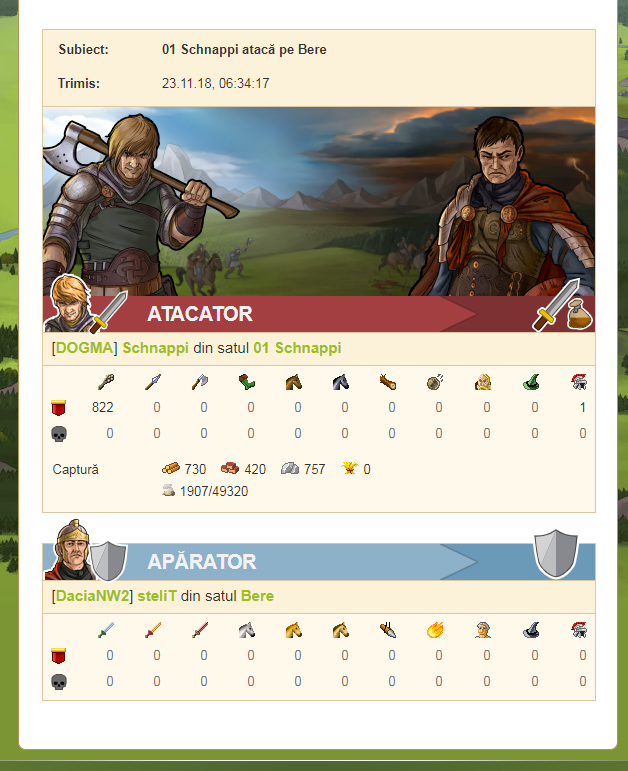 We are still missing 1200 players in smaller alliances from 5 members and down. It is small differences from week 2. Most metas have got more players when my crew have updated the lists. Uollas have lost ~50 and Turkey too. Cicco excels in showing us reports from their war with nPL on the border so I asked the diplomat in nPL, DEF IN PROGRESS for a comment about it. 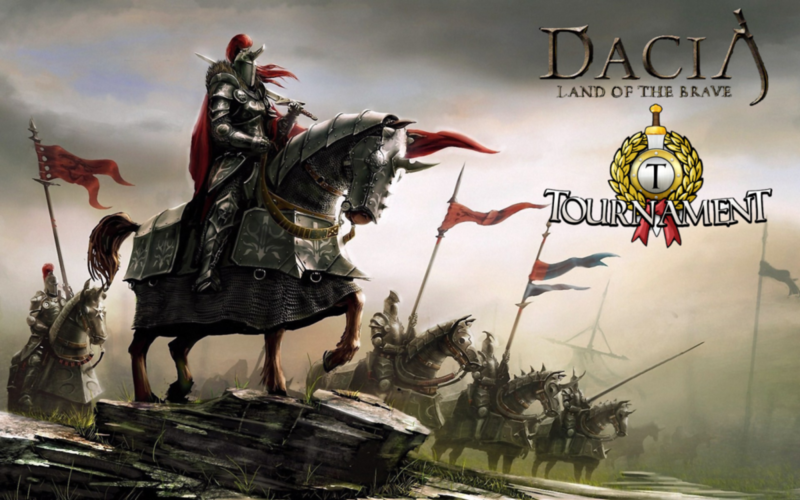 Krzysiek/kostek: Server started with us playing with Dacia, we were alone in our quadrant. We divided that quadrat but for simplicity sake let’s sum it up: nPL goes into grey zone, Animals are close to provide help with deff, rest of Dacia are more back securing other important sites. Unfortunately Animals decided not to play with Dacia. I will not comment about it, we had little to no impact about that situation. 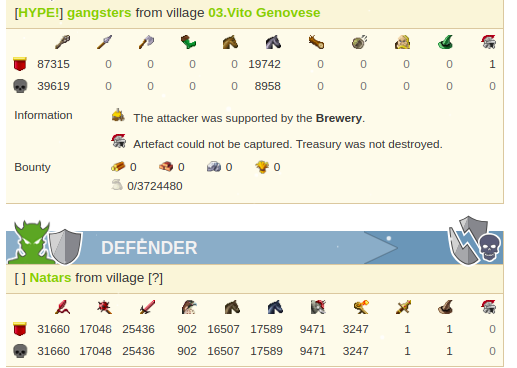 It was right about settling up with second villages so we were already in kind of a pickle. 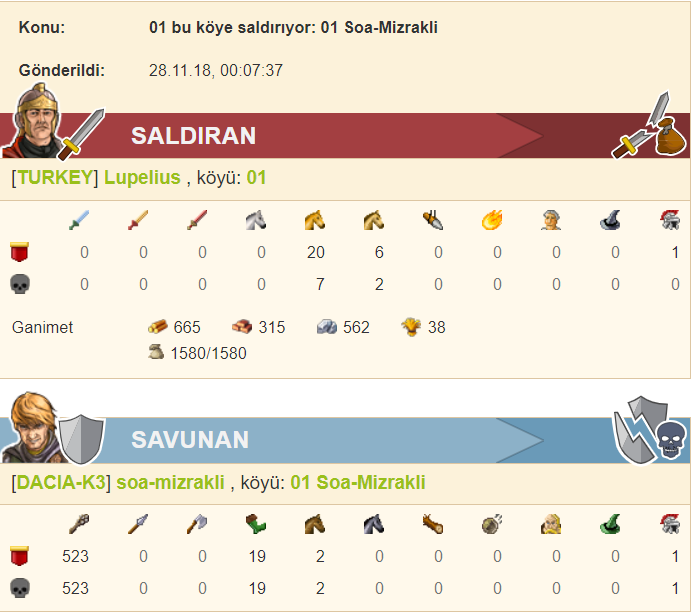 We expected someone to be in grey zone maybe invade but we did not see Turks playing against us. 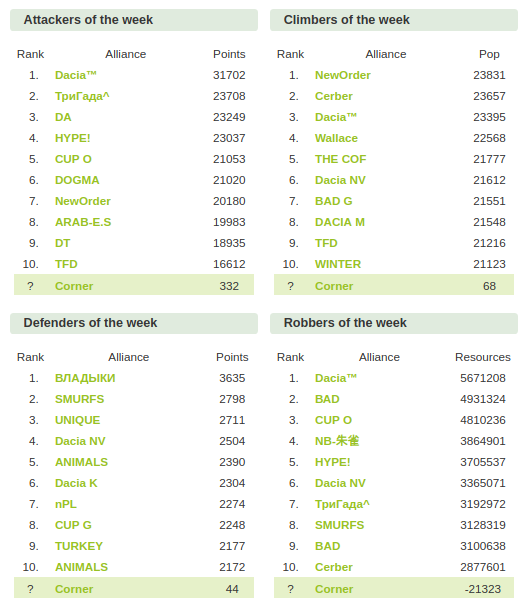 It’s not that hard to see that currently nPL is fighting 1v3, terribly outnumbered with Russians, Uollas and Turks, that also separated us from Dacia. We could see that Italy decided to invade our border early, it’s not that strange, they have more or less clear quadrant, and I doubt that they just wanted to sit AFK letting other have fun. With all of that series of unfortunate events combined we are stuck with our situation. But i can promise you that we will fight till the last village and last account battling Animals Hype and all of Uollas meta no matter the odds. Safiren: What about that I've been told that several polacks have gone into vacation? Safiren: I'm used to see nTPl doing great,you have a harder mission this year, and you're using the name nPL. Why this change? Safiren: I haven't been reading your forum, but last year you quarrelled a lot, I guess it haven't changed? Krzysiek/kostek: I guess some things never change (cwl), but right now after finals started we have our own little forum on skype were we more or less are friendly.... maybe with more weight on less (chuckle). Post was edited 3 times, last by Safiren ( Dec 20th 2018 ). Gettertools have mended their maps so now it is possible to see the whole Final map again. I started to do new ones and began in NorthEast, the Uollas meta. 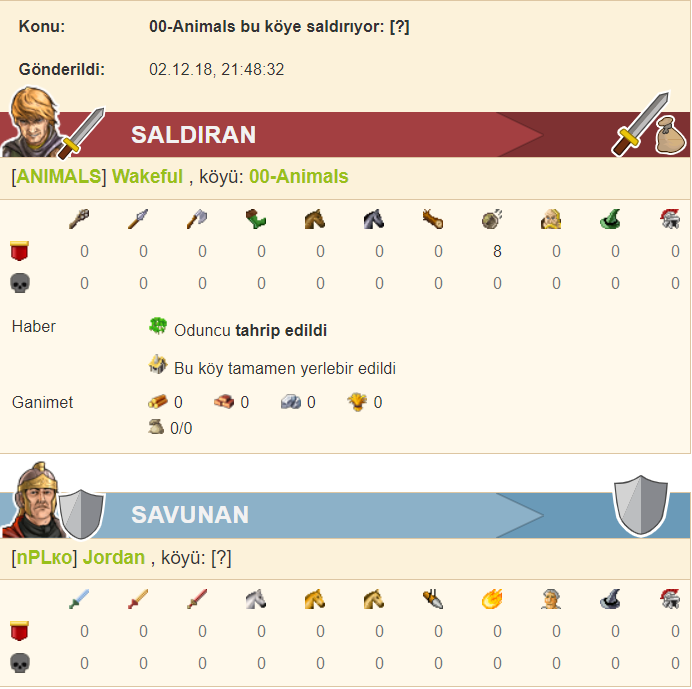 The meta consists of several nations, from Turkey we have COF with 600 accounts, Uollas with 300 accounts, Shield (arabs) 200 accounts, CS 110 accounts, G&V 80 accounts and TFD (Netherlands), NewOrder, Poilus (France) with together 100 accounts. 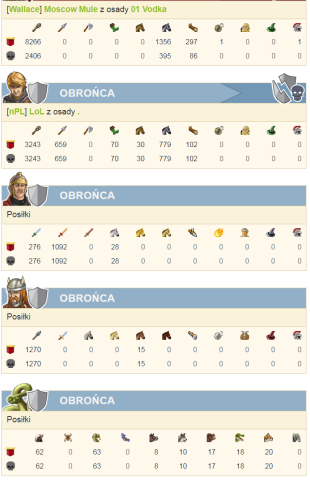 Uollas is closer to Gray zone and the most offensive alliances in the meta. 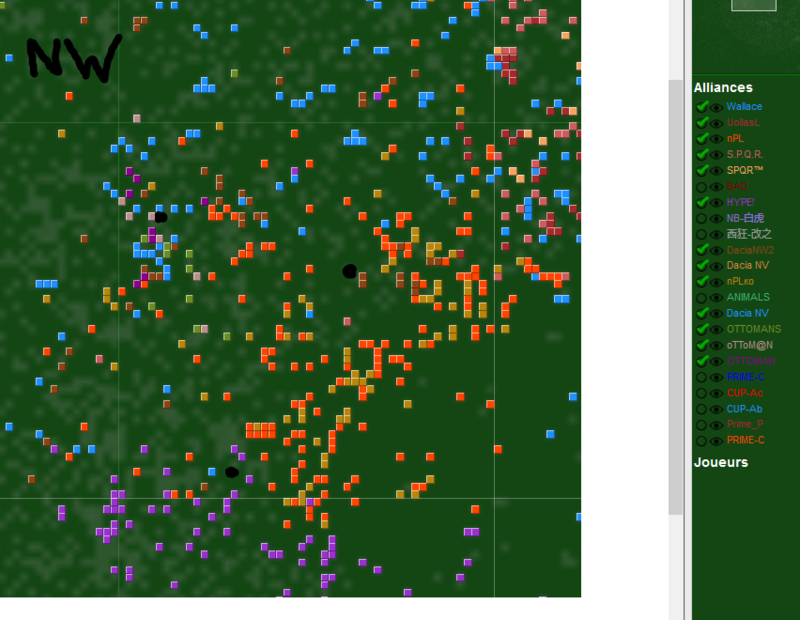 Among the COF alliances, The COF and COF ANT seems to have been involved in a border war with CUP. Shield is building a stronghold around the WW 100/100 as NewOrder also do. CS and TFD is situated at the NW border but I haven't seen any real actions from them yet. It’s only a few enemy alliances in NE, NE-buni (Dacia) and ВЛАДЫКИ (Russian). The reports I’ve seen from NE-buni is that they have been walled by CS. ВЛАДЫКИ looks to have been better on defence. Due to the high number of accounts, 1400, the NorthEast meta has a significant chance for victory this round. They have a lot of alliances with nothing else to do than building defence for WW or WWK’s. The server has been running for a little more than one month. How is it going? Have you achieved what you wanted so far? All metas this year consist of players from several domains. Any combination that have surprised you? How about your enemies? Do they give you a fair fight? Which quad is the most interesting due to expected fights this year? It wasn’t many wildcards this year. Bad or good and why? 1. Hi my dear , we are at a nice point of the finals, for us is going very good, we are happy for the creation of this new meta and it's like the meta is working very good, we are doing everything we want to do. We are achieving nice things day by day, and of course, we are achieving an increasement of communication in the meta and the organization is growing. 2. Yes a lot of combinations this year.. uhm… I don't see something impressive, maybe just the fact that Poland is splitted in 3 metas, one with Dacia, one with CUP one with Int SE. 4. I think SE but there are zones in the other quadrants ( borders ) maybe more interesting than the entire SE. 1. Well, the server has been started for a month now. 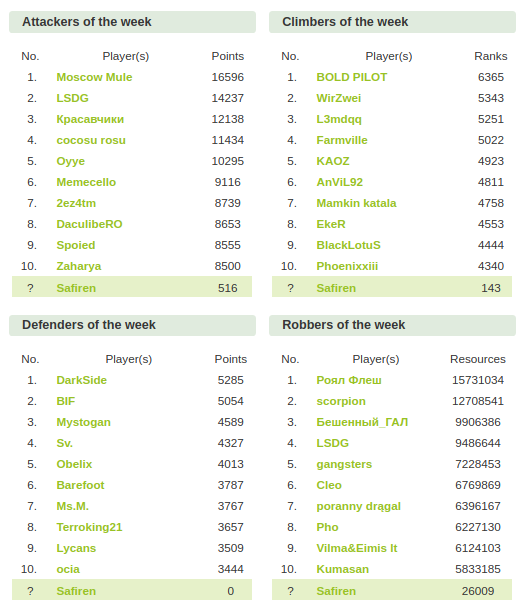 Our Uollas-META is growing well, there are many new alliances we never played together before and with which we are doing a great job, but there is still a lot to work on. 2. Currently no surprise, we already knew from what alliances the various confederates would have been composed. The only surprise, if it can be defined as such, was the breakup of the Meta between Dacia and ANIMALS. 3. 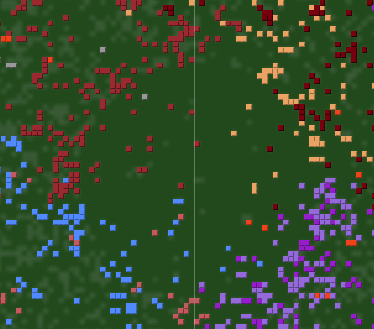 Regarding the enemies, our quad is fairly quiet, so we are focusing on the borders, especially on the one with the Poles (nPL). But, looking at the whole server, it does not seem that the Russians are doing a fair game. 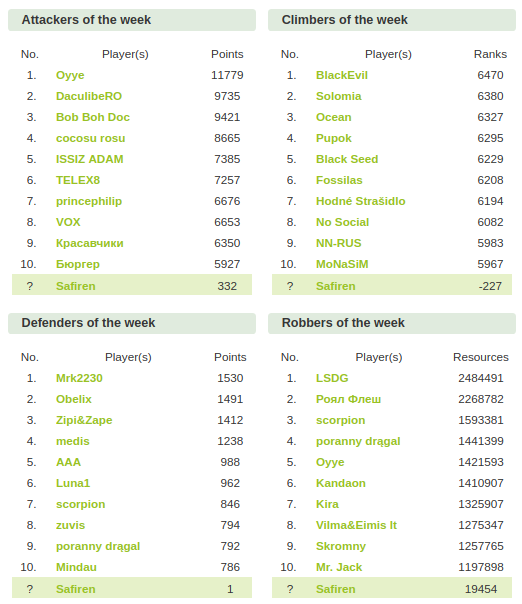 They are doing a lot of hammers with the help of multi accounts, you just need to see the top raids, 8 out of 10 were Russians last week, and the first 3 Russian alliances raid an indecipherable amount of resources every week! 4. Up to now the most interesting quad is -/+, it is no coincidence that the first alliances in top attacker and defender are precisely those found in -/+. Within this quad there is war between Dacia and Animals, between Dacia and Russians on the border with -/-, between Animals and Russians on the border with -/-, between nPL and Uollas on the border with +/+ and between nPL and Russians on the border with -/-. Another interesting sector is the +/-, where the confederates CUP and PRIME are clashing, and Chinese are clashing on the border with the Russians. 5. I think I've already answered a similar question before the start. In the first interview I said that I was in favor (because many wildcards are used for multi account) and against (because it penalizes those who could not play the qualifications) . But now, after 1 month from the start, I can say that it was just an idea that penalized those who could not play the qualifications, since the Russians continue to have (even without the help of wildcards) hundreds of multi accounts. I am usually fastly bored during finals but this is the first year that I'm not. There is a very good teamplay in my Meta and every one likes to work together, so that's quite of a perfect final server for now. 2. Even if every combination were known before starting, I'd say that SE combinations are the most surprising and interesting for me. We've been playing with NB as COQ a few years ago, and we had some hard fights against PL during qualifying, so it's a strange feeling to see them both united now. 3. 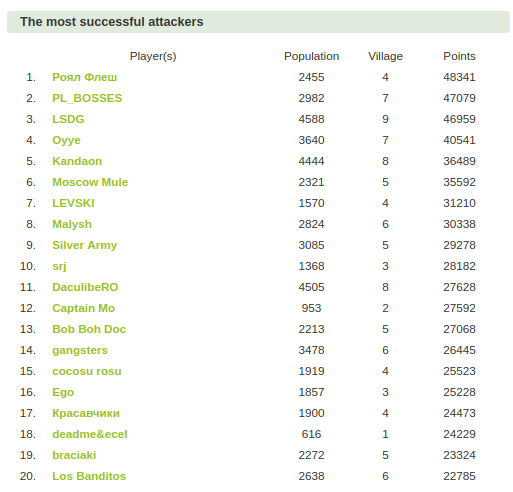 For now, well, I'd say it could be more challenging, but still I have seen a lot of nice reports. I also saw several ones from other quad which are very interesting and i think some of these got harder fights because of people's location inside the quad. 4. I think every quad is very interesting, but i closely follow the fights with ANIMALS, i find this particularly interesting. 5. As I said during prequalifying interview, less wildcards gives less multiaccs, so I think it is a good point. This way, there are more real players playing together. 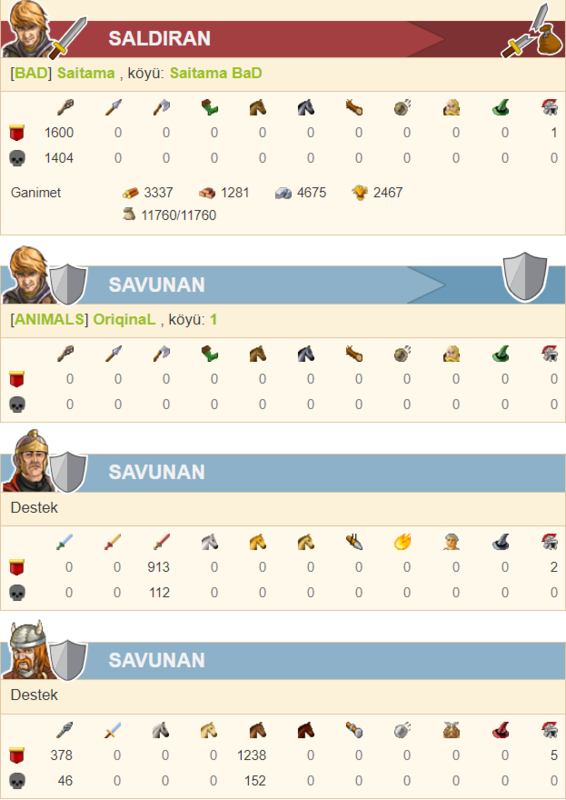 Even though, we had some troubles finding a key for every of our player, which led to a few less account as expected. Thank you for your job my dear! 1. For this finals we created a completely new Meta and we spent the last weeks partly with increasing the work together. I see a lot of potential inside our group and day by day our work is becoming better. 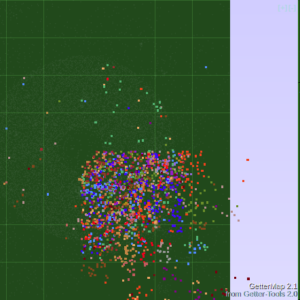 For NewOrder it's a quiet server untill now, since we have mostly no enemy inside our territory. As Meta we started to do pressure at the borders and it's going pretty good. 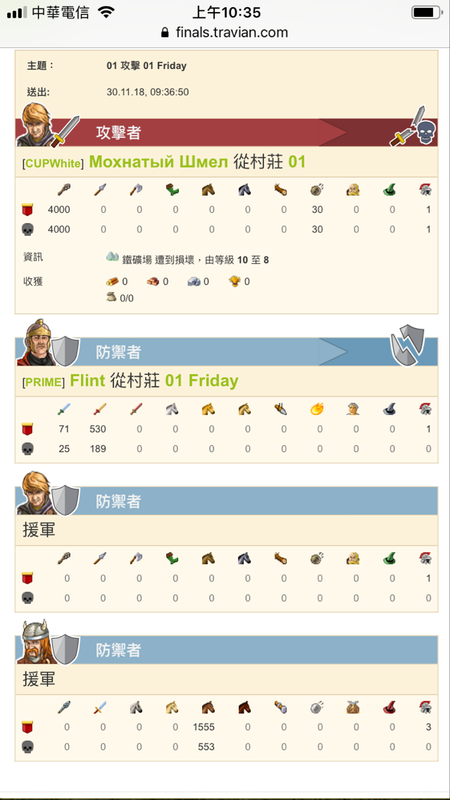 Still, I think the first weeks are gone for growing and I expect action will increase the upcoming weeks significantly (artefacts are close). 2. 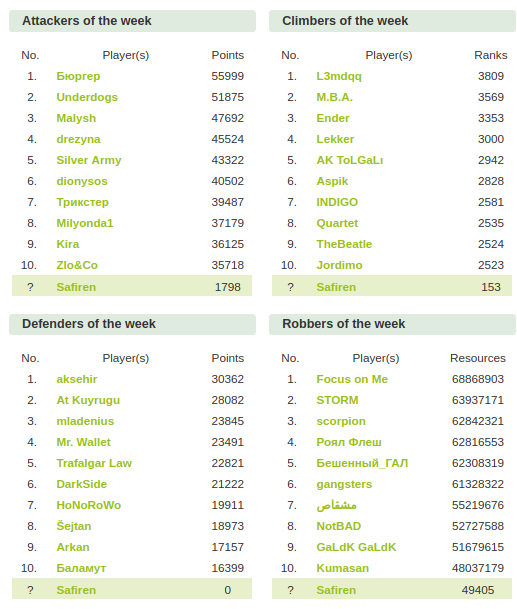 I'm not suprised at all, only some changes in subgroups. The big "players" we see as usual with some changes inside their Metas. 3. As I said already before - for NewOrder it's pretty less action in territory. 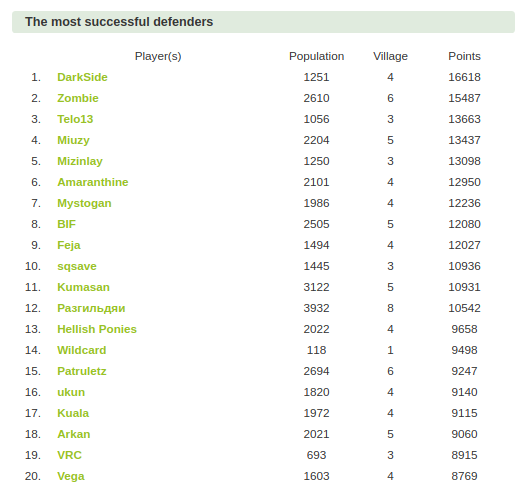 All in all there is less enemy in our whole Meta area, so we're fightling mostly at the borders. 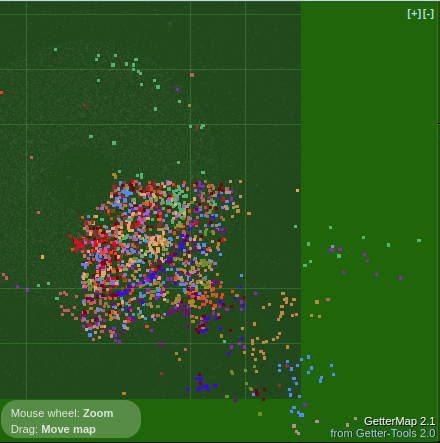 This may change after artefacts with more moves across the sectors and then we will see, if there's a fair fight at all. 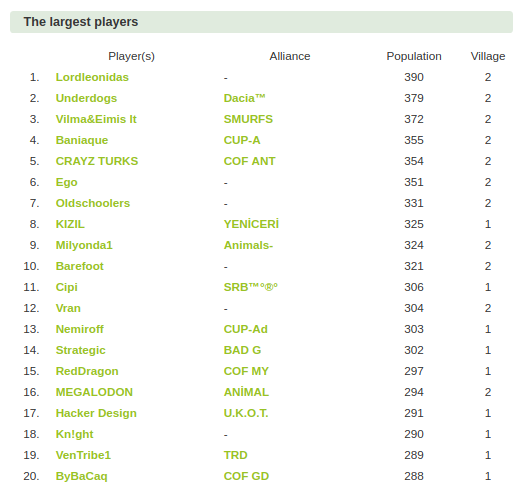 Just have a look at some groups and their top raiders ... nothing more to comment! 4.I think the most conflicts we see at the borders. -/+ is exciting since there are different conflicts like Dacia vs. Animals, Russia vs. Dacia and so on. 5. Everybody who wants to play finals can get a ticket by playing qualification. You do not even need a lot of work to get your ticket. I don't see the necessity to have a lot of wildcards for players. Less wildcards may reduce multiusing (still there is an option going for multis via qualification tickets). So for me is fine. 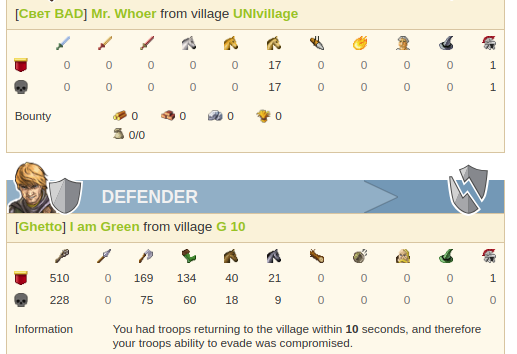 1 Yes I build a little more troops than I had wished for. 2 In fact....we and the turks. 3 It's all I expected from Dacia. 4 I think it's gonna be between Italians and Russia as last year. I’m still waiting for a couple more answers, if I get them I will add them later. 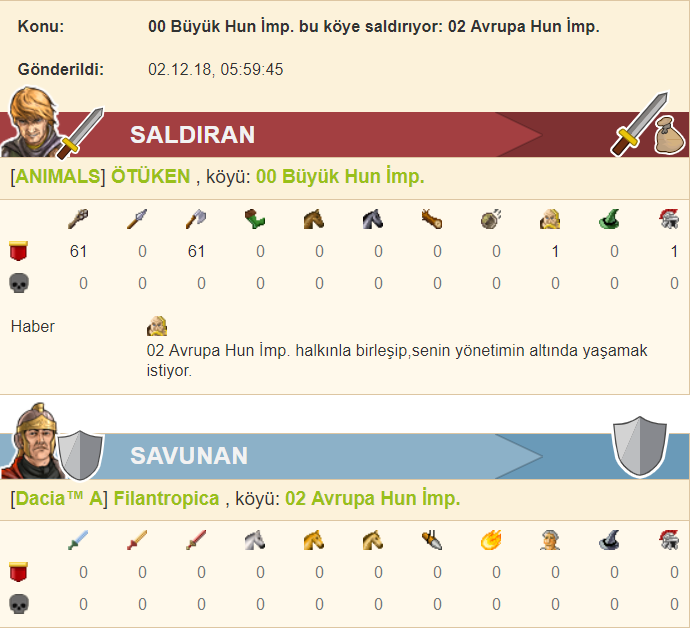 Luffy Dacia has a really nice hammer but RECKLESS SÜVARİ had an ever better wall and look on that zoo! 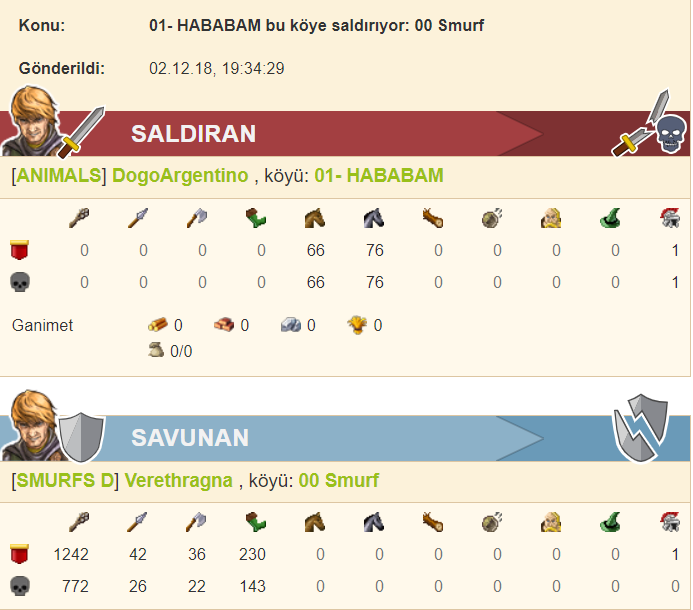 A busy morning, we landed again on SUVARI capitals at 4:00 pm, 4 groups from Dacia tm and a group from SMURFS in our intention to destroy as quickly as possible this Turkish alliance placed to the left of the WW zone. On 4 capitals we did not find deff and we caused big damage, and on the Underdogs group a Turkish wall was made ... unfortunately for us too much deff, too like the tzara ... and we lost some armies. Nothing venture nothing have. We have no other direction than before, players who have lost their armies are motivated and confident that they will be riding again on the Dacia train shortly and it will not take long until we see them again on the position of the locomotive. There are four days since we attack nonstop, and we have 15 capitals destroyed partially, some even completely demolished + extended to Reckless Suvari, which was deleted yesterday. It's okay, sorry, win some, lose some ... so it's at war! So close yet so far, few mistakes were made and the cropper survived with only lvl 8 stone mansion remaining, followed by suicide later on. nPL vs Animals - and rams! Hype! 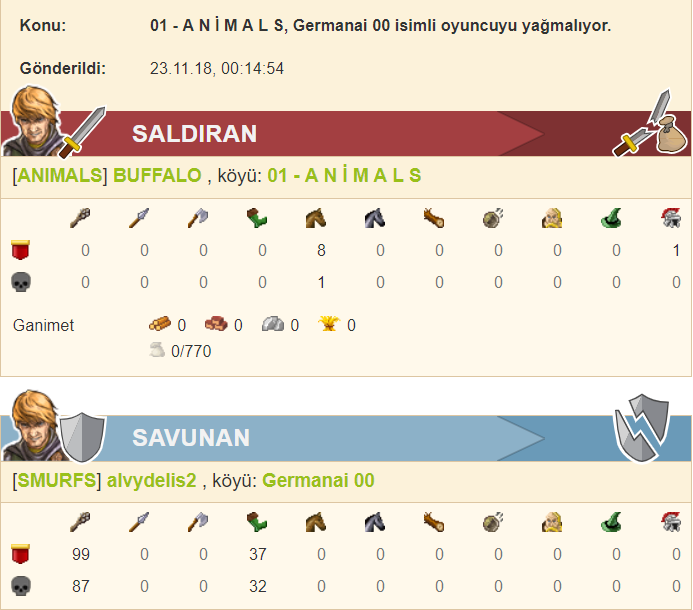 vs Animals, this time the wall wasn’t enough but it was an expensive victory. 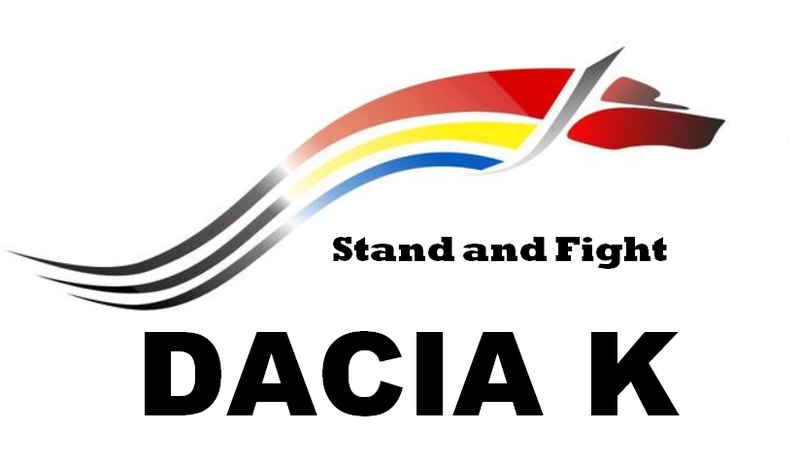 The German alliances FC and Dogma have had a hard time in Dacia area but they zeroed this Dacia village. Dacia K Katarina - nice hammer! 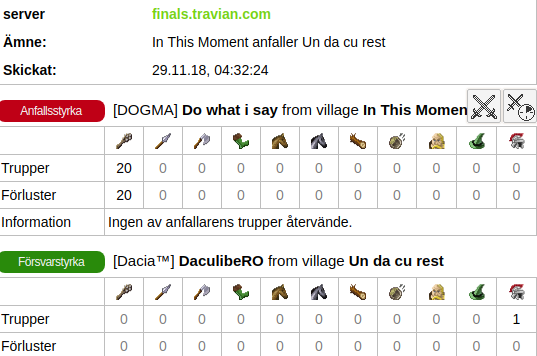 Dacia vs Dogma that got help from friends in Uollas meta. 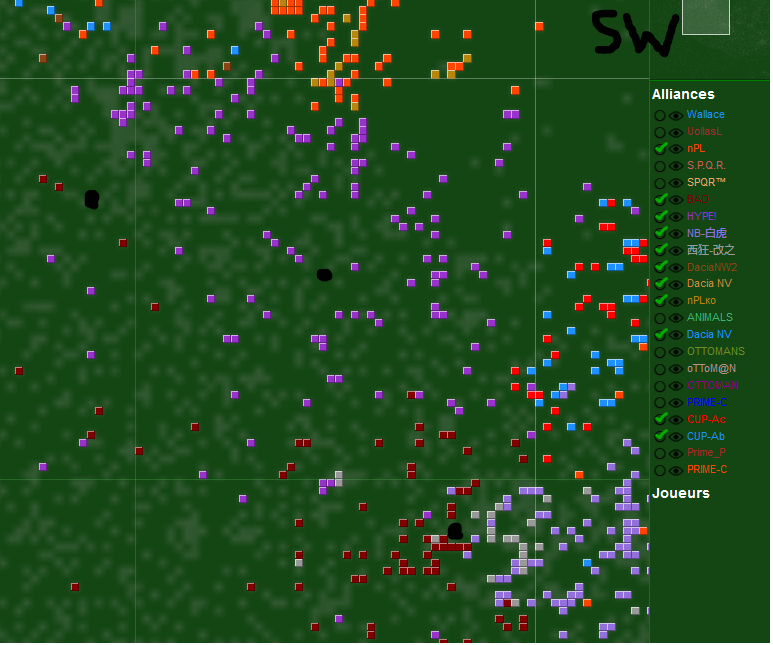 A small Romania alliance, only 11 members, in NorthEast isn’t scared to go on the bigger alliances but most often meet a wall. Most battles have been at the border NW so most reports are there. Post was edited 3 times, last by Safiren ( Dec 21st 2018 ). In the meantime post your reports in the Discussion thread and check out the other domain's forum as the Turkey for example. Get the chance to win gold and gifts in the Artefact contest! Post was edited 2 times, last by Safiren ( Jan 1st 2019 ). 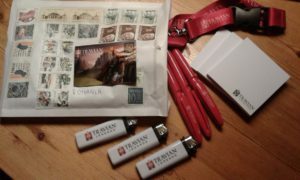 The new year started with the artifacts arrival as usual. Compared to last year it was 34% more def in small, 14% more in Large and Unique. Hmm, I wonder if I have the right report for small last year? 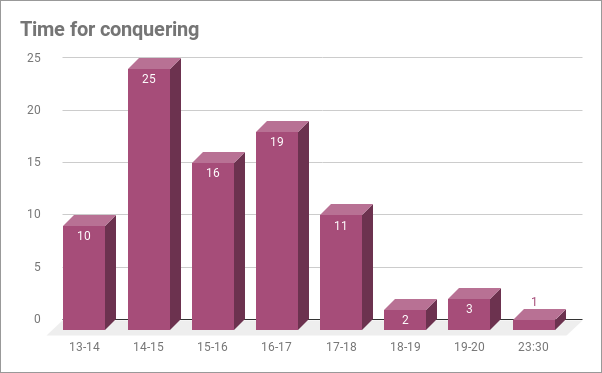 The conquering times was a little more protracted than last year, probably due to the less amount of players, but most was gone in 4 hours as usual. The first, a Great architect, was taken by Gargamel, Dacia, at 13:13 and the last one, Small architect, at 23:30 by Fullofbeans CP PT-BR. Unique Architect: Efet from BAD at 14:07. I will write more about this in the War diaries on Friday. I have to continue on this tomorrow, bed is calling. 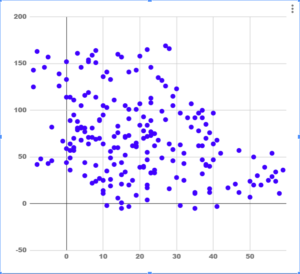 The trend that WWs are taken early continue. Already before artefacts 5 was taken. Now every meta has its own. 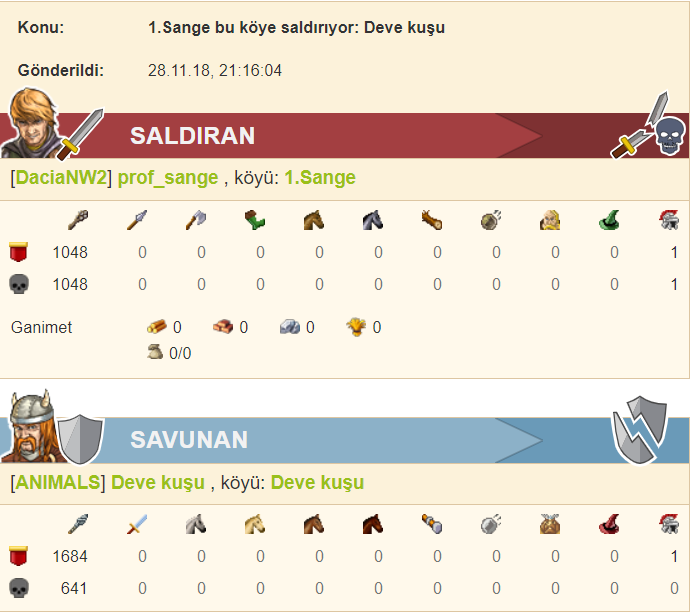 SÜVARİ (Turkey) was the first and took the WW -100/100 in a revenge for the broken coalition with Dacia. Will Dacia take it back? Turkey has shown they have a lot of defence so it will not be easy. WW 480 pop. No Architect. Maybe Dacia has decided it isn’t worth it - yet. Instead they took a WW in Gray zone, -12/2 - as the last of the metas. 254 pop. Great architect. In Uollas it was Shield (Arabs) that settled on 100/100, they have not surprising they have been building around it since the start. 588 pop. The COF (Turkey) holds a second WW at 100/0. 445 pop. Great architect and Unique Confusion. 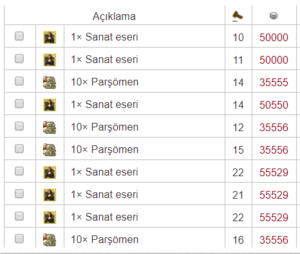 In SouthEast we have two metas, For Immortals it is Prime, mainly Russians, that holds the WW at 100/-100. 626 pop. Great architect. CUP, mixed international, took the WW on 0/-100 351 pop. No Architect. Union (Russian + mixed international) has -100/-100 of course. 293 pop. Great and Unique Architect. Hugo from NB (China) is the storyteller. When the sun rises up, the workers are busy on repair the villages. In recent days, Chinese NB is fighting against CUP Alliance. WildDog become CUP team’s new objective. His villages are being hardly broken, and the workers are trying their best on the defence construction and repair before CUP army comes again. ‘bing,,,,bing,,,,,’ luckily the alarm is on again. 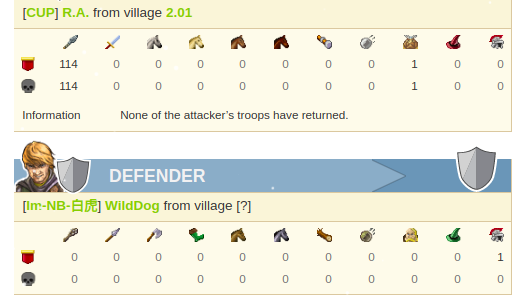 All seven Wilddog villages receive enemies attack. However the defence construction is not complete yet. In the NB councils house, all generals are riots and worrying. Because WildDog’s villages are too far away. 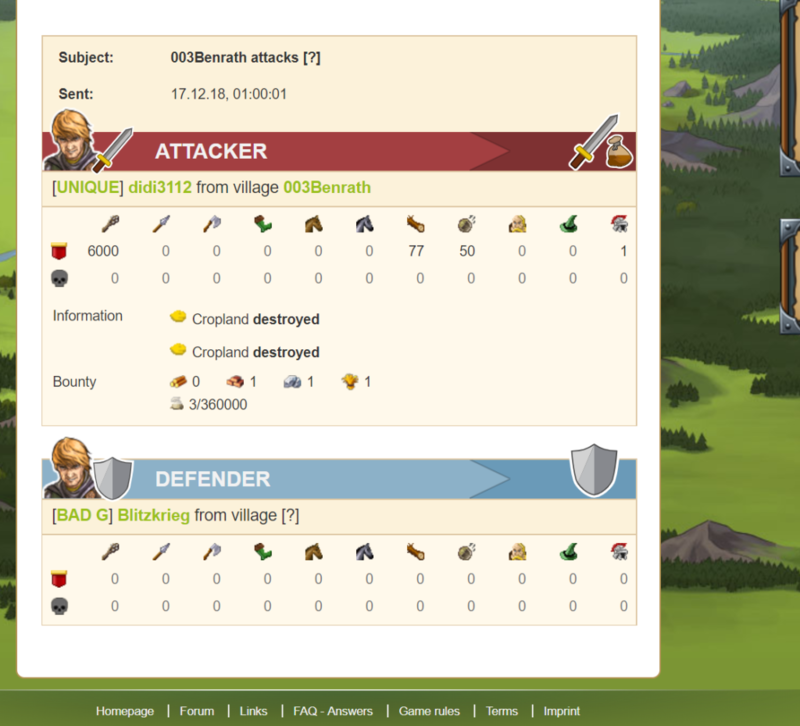 Not enough NB defence army can arrive before CUP start attack at 11:06:18. Moreover the walls of Wilddog villages are destroyed already. He will not able to stop CUP army again. 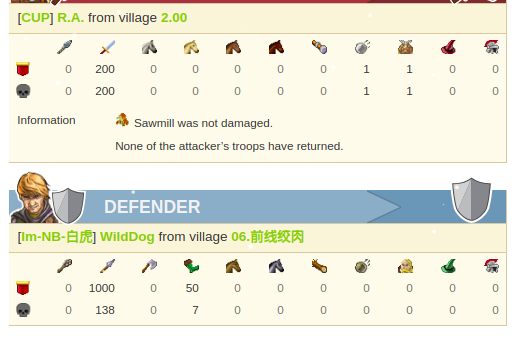 Luckily, another scouts report saves NB and Wilddogs. ‘Don’t worry,,,,,’ sunky and Abby looked to the door. LSDG just came into the council house on time. 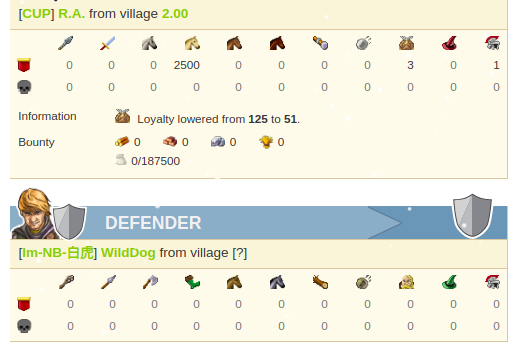 ‘I can help Wilddog to repair the village’. 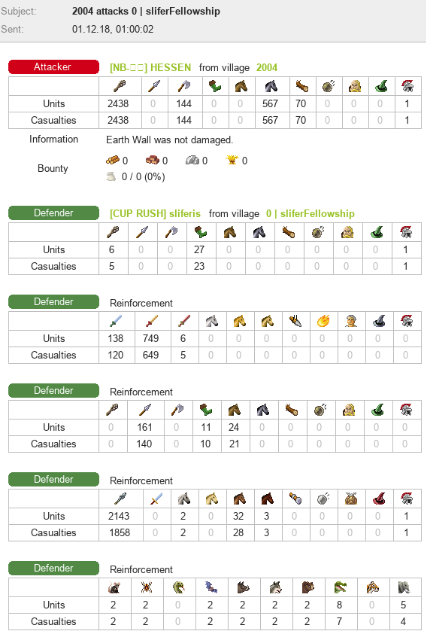 When CUP army arrive 7 -46, they are surprised the NB army and level 20 wall are ready for taking care of them:. 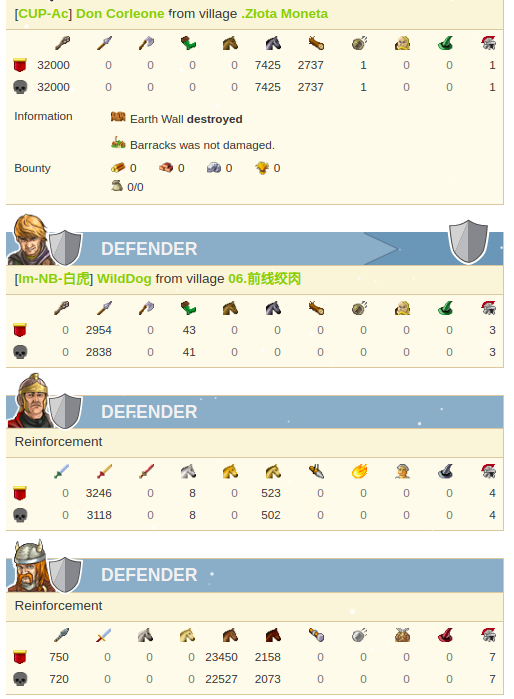 The second part is from the 4th January and even if Wilddog saved the day then there must have been more attacks later because the village is obviously destroyed now. I like the effort to amuse us so I paid 30 gold for this. The workers of Wilddog are repairing their wall again. The war between NB and CUP is still continuing. 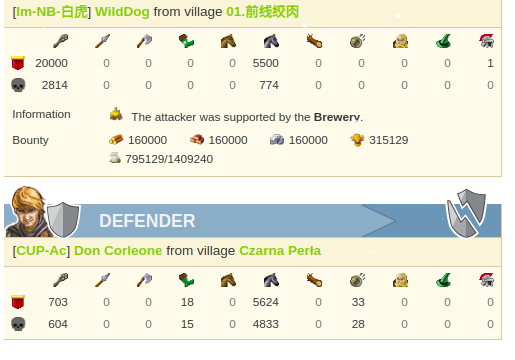 After the victory of defence Don Corleone in 23/12/2018, WildDog pays much money to his workers and try repair defence without sleeping. ‘BING,,,,,,,BING,,,,,’ The alarm was ringing again. Luckily in NB council, devil_u, tofung, master, Jannah still had not slept yet. ‘Actually they should attack 9 -48’ After 10 minutes discussion, they concluded’ If they do not attack Wilddog’s military base, they will not gain benefit. Wilddog using the Tablet of Law. Abandoned valley ‭(‭11‬|‭−‭45‬‬)‬finally become safe. Also 06:49:51, 01.前线绞肉 ‭(‭9‬|‭−‭48‬‬)‬ finally caught the real attack. However the NB defencers already arrived. Therefore 9 -48 also safety:.